A year or so ago, shyguy started a thread titled: "Why aren't you posting your projects?" Why indeed. I had been mulling over story ideas about a RCT3 family visiting one of my parks, and shyguy's question spurred me into action. When I finally began writing my ideas down and assembling them into a coherent story, I was still an unregistered lurker here (and had been since dinosaurs roamed the Earth, or so it seems.) I just recently joined SGW to learn the ins and outs of posting text and images in preparation for long projects like this one. And it is quite long. So I'll be posting it in smaller, easy-to-chew segments. I encourage all you lurkers out there to join SGW and become a participant- If this 65 year old guy can do it, then so can you. 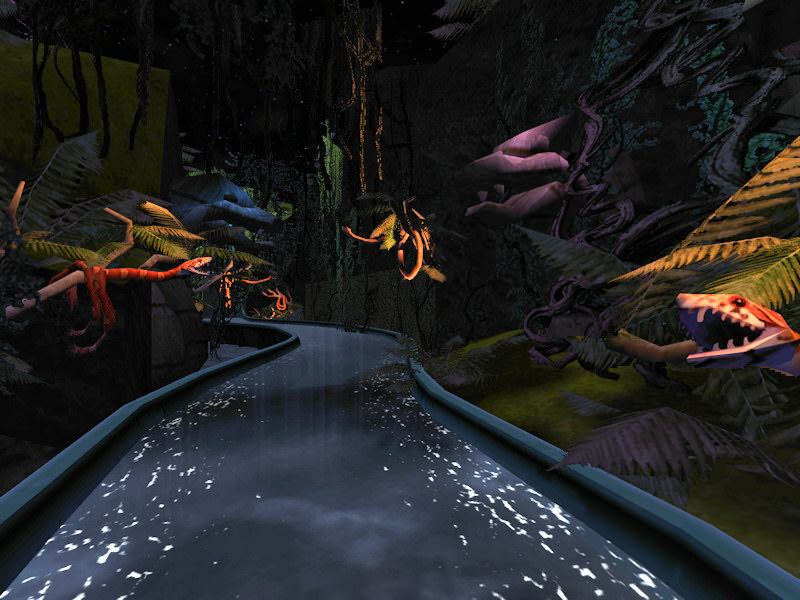 This is the third version of my Imaginarium park; completed 4 years ago in 2014. The first two versions were somewhat larger, more detailed, and a lot more unstable. 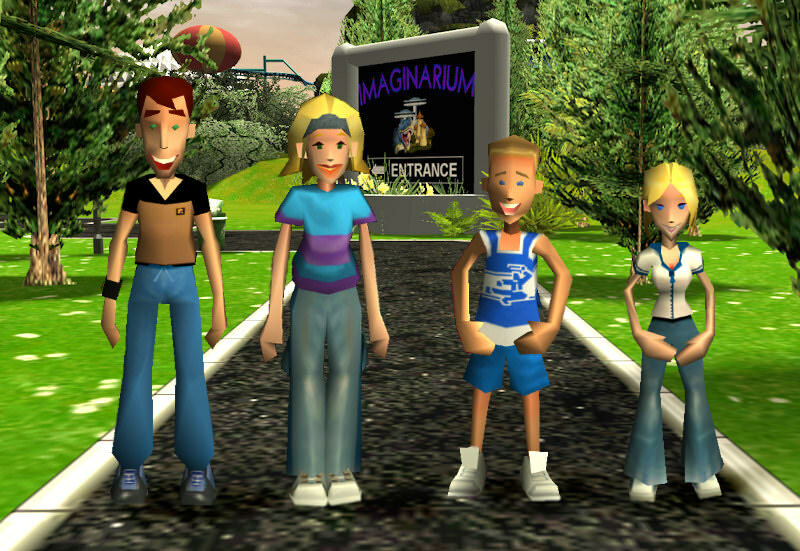 At the time that I was building Imaginarium, I had no idea that I would be writing a story that takes place in the park. 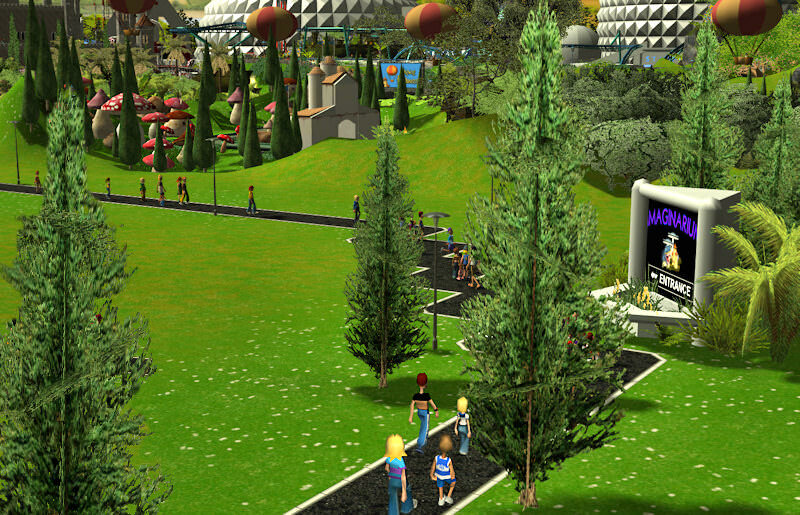 So this story is being written (still incomplete) to fit the park and not the other way around. Many, many thanks to all the custom content creators who work so long and hard to share their artistic creations with us. A soft [ping] is heard. Or maybe it's more of a [blip]. Or maybe just a subtle, silent shift in the vast space-time construct that is the universe. 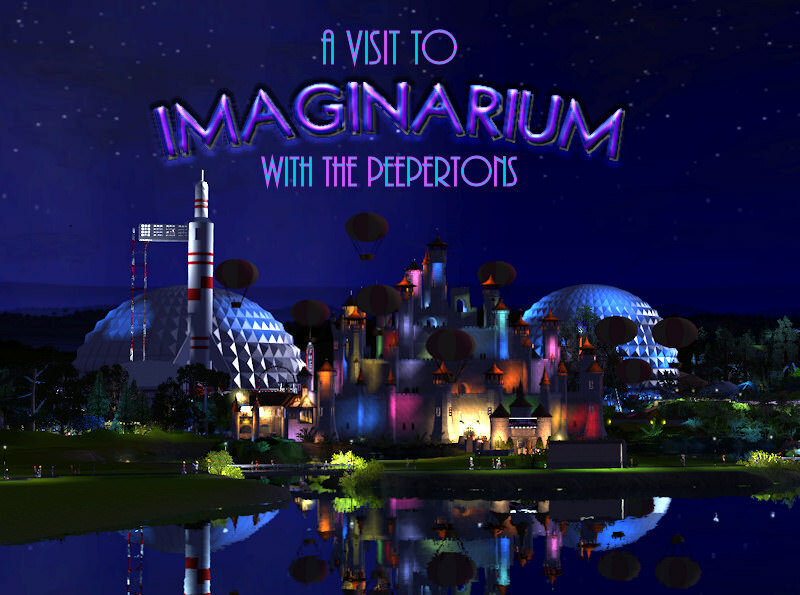 Whatever it is- a family of four materializes on the peep injection point at the end of the 'Parking B' walkway; one of two walkways which lead to the entrance of Imaginarium theme park... the Peepertons have arrived. Wally looks at his family with an excited grin, "Well kids, here we are! On our way to Imaginarium!" "Yay!" Baxter exclaims, jumping twice into the air. Tiffany, who is now a teenager, shares her older brother's enthusiasm but neglects to jump into the air- that's for kids, "Ooh, it looks so exciting!" she says, "Don't you think so, Mother?" Lately, Tiffany has started referring to her mom as 'Mother'; the teen thing again. Jill looks at the park spread out before them, "Yes, it looks very exciting! Storybook Gardens looks like a fun ride." Jill peers at the long serpentine walkway ahead of them, "Oh my. How far is it to the park entrance, I can't see it from here. We'll be worn out before we even get there!" All thoughts of the path ahead are pushed aside as Tiffany lets out a shriek, "Eeek! Mother, the parking lot is gone!" Indeed, Parking Lot B is nowhere to be seen. Baxter, always the adventurous one, looks in gleeful wonder at the vast expanse where the parking lot should be, "Cool!" Tiffany continues, "How did we get here?" Jill, "Well... in our car, of course... at least I think we did... I can't seem to remember." She looks at her husband, "Wally?" Wally frowns and scratches his head, "I thought so, too... but now that you mention it... I mean, how else did we get here?" He grins, "Do you think maybe we just appeared out of thin air?" He looks back warily at the non-existent parking lot and chuckles nervously, "The Gamer works in mysterious ways," he concludes. In truth, the Gamer decided not to include the parking lot- too many unnecessary polys. As the Peepertons begin their long walk to the park entrance, Baxter points and says excitedly, "Hey, look! There's the FreeFall rocket! 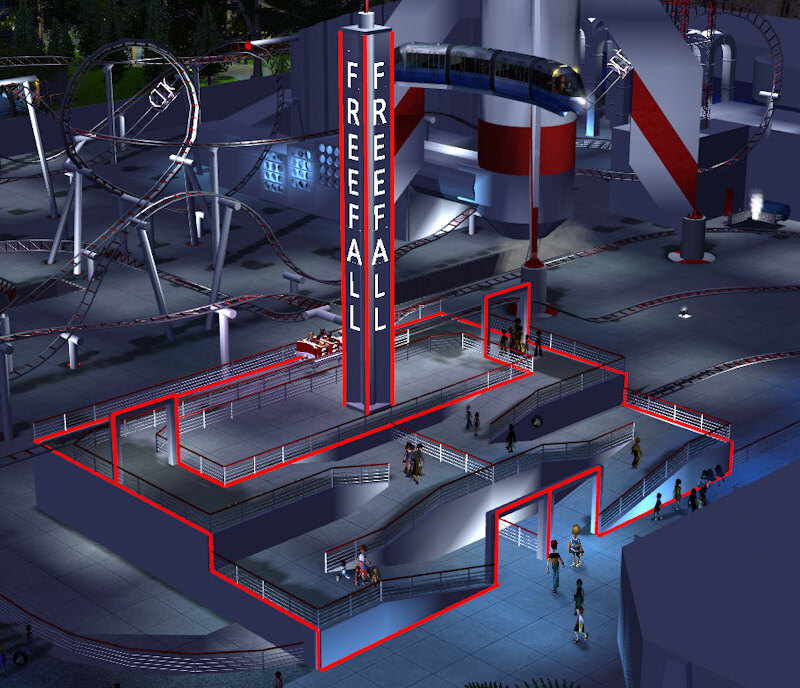 I can't wait to go on FreeFall! The car climbs up the gantry all the way to the top, then falls straight down the inside of the rocket and out the bottom..." His expression slowly shifts from excitement to concern, "Wow... It's so TALL... I bet you can see it from anywhere in the park... Just looking at it makes me wanna... [Yeeurghh]." Tiffany looks down in horror and disgust, "Eewww... Mother, Baxter just yeeurghhed all over my shoe!... Eewwww!" Jill takes a kleenex out of her fanny pack and hands it to her daughter, "Here, dear. Take your shoe off and wipe it on the grass over there. Then use the kleenex to finish up. That'll have to do for now... And you, young man," she turns her attention to her son, "Honestly, Baxter. If you're going to get sick that easily..."
"Aw, Mommm," Baxter says while wiping the corner of his mouth with the back of his hand, "It's just a little puke... It won't happen anymore." He gazes again at the towering rocket, "It's just that... it's so high up an... [Yeeurghh]." "Eeewwww! Now he yeeurghhed on my other shoe! MOTHER!! Make him stop!" Tiffany moves to the other side of the walkway, as far away from her brother as she can get. Two weeks later, as morning turns to afternoon, the Peepertons are about halfway to the park entrance and the kids' excitement mounts: "Aren't we there yet?" "I'm tired." "I need to pee." "I wanna go home." Their dad tries to cheer them up, "Aw, c'mon kids. We're almost there!" He squints into the distance, "Look! The entrance is just ahead. We'll be there in no time... a week... two weeks, tops!" As they continue their journey to the park entrance they see other peeps leaving the park, heading toward the non-existent parking lot. Baxter points at a kid's Imaginarium balloon, "Cool! I wanna get a balloon like that. It's got dinosaurs an' castles an' futuristic stuff." Tiffany, her shoes still a little squishy, looks disdainfully at the balloon, "Hmmph," she says snootily, "balloons are for kids... Ooh, I like that clear one! It looks like a dewdrop sparkling in the morning sunlight." Baxter rolls his eyes. 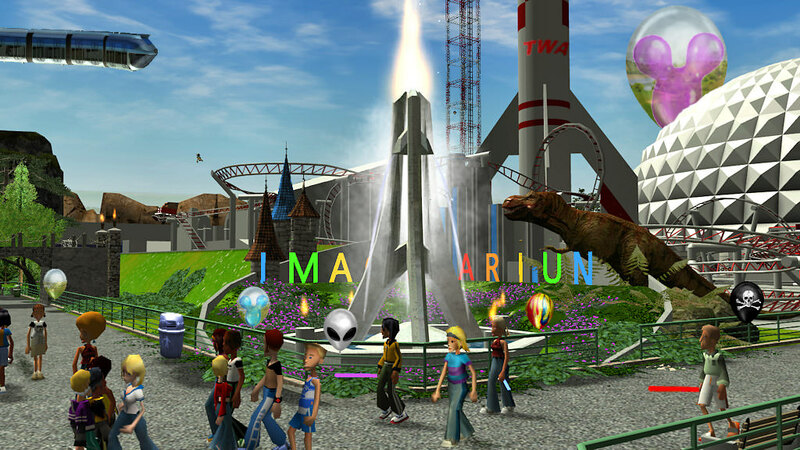 As the sun sets and the sky darkens, the colorful park lights begin to flicker on, giving Imaginarium an excitingly magical and other-worldly appearance. "It looks excitingly magical!" Jill says. "And other-worldly," Wally adds. Another two weeks go by and as the sun rises, the Peepertons finally arrive at a small hub where the 'Parking B' walkway merges with the one from 'Parking A' and the path turns to face the park entrance. 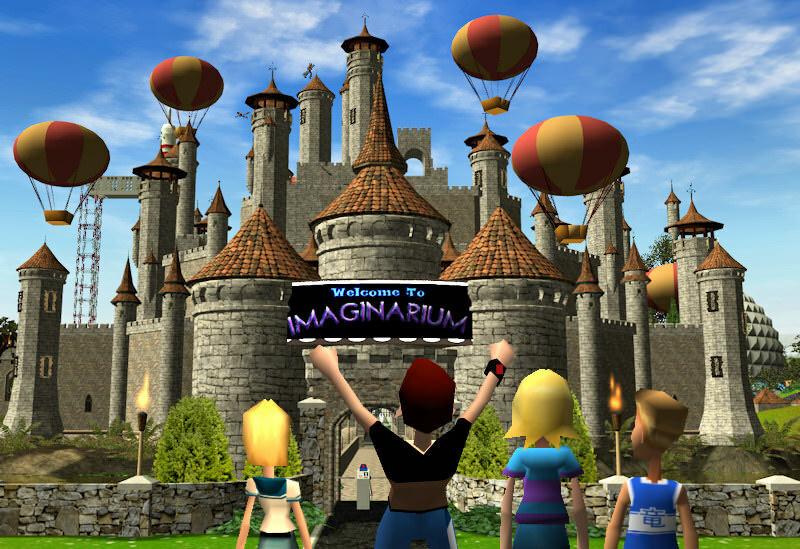 "Welcome to Imaginarium!" Wally reads the sign aloud with gusto. 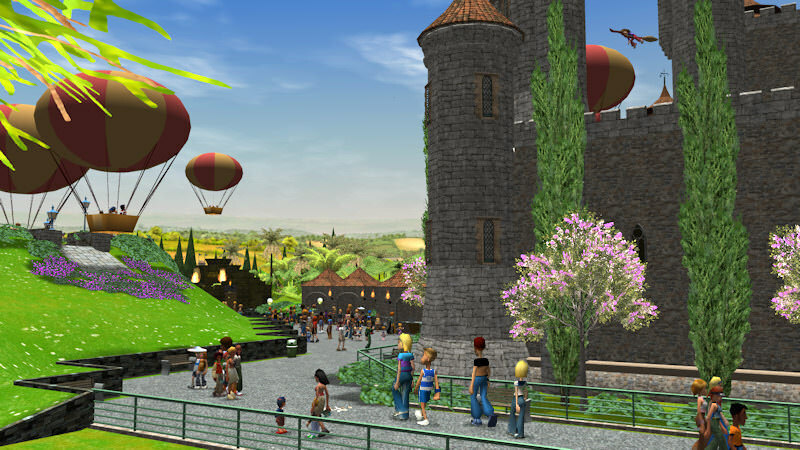 As the Peepertons walk through the entrance turnstiles and onto the bridge leading to the castle, the SkyTrain soars by just above their heads. The kids' enthusiasm rekindles: Tiffany, "Ooh, it looks even more exciting close up! 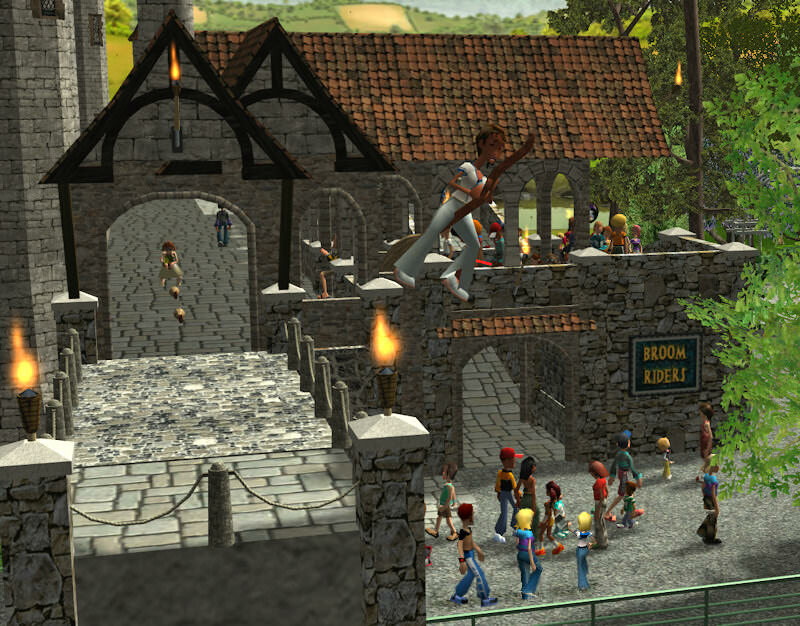 Look at the people flying around the castle on those brooms! I wanna go on that!" She sees her brother turning an odd shade of green, "Mother! Baxter has that pukey-face look again... he's gonna blow!" She distances herself from the 'Human Geyser', as he is now known. Baxter, struggling to keep his innards inside, looks down, instead of up, "No I'm not," he says, hoping it's true. Slowly, his 'pukey-face' goes away. 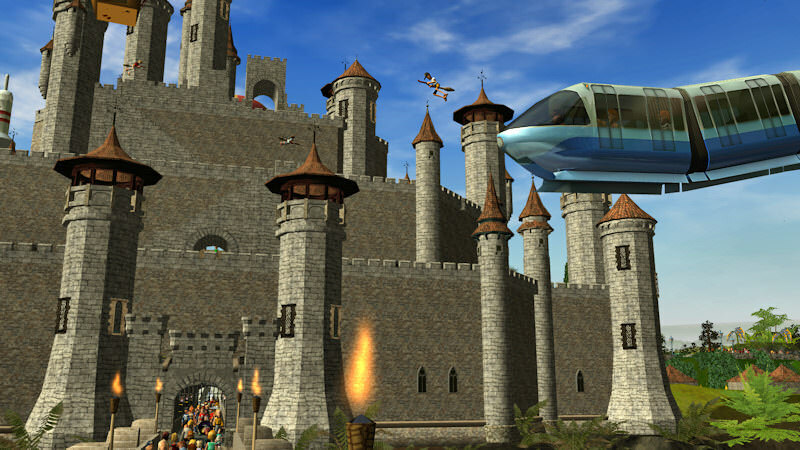 He gazes intently into the clear water of the castle moat, "Cool, look at those dolphin-shaped submarines! That's the Voyage To Atlantis ride." Jill looks at the elegant-looking subs gliding beneath the water, "I think we would all enjoy going on that!" 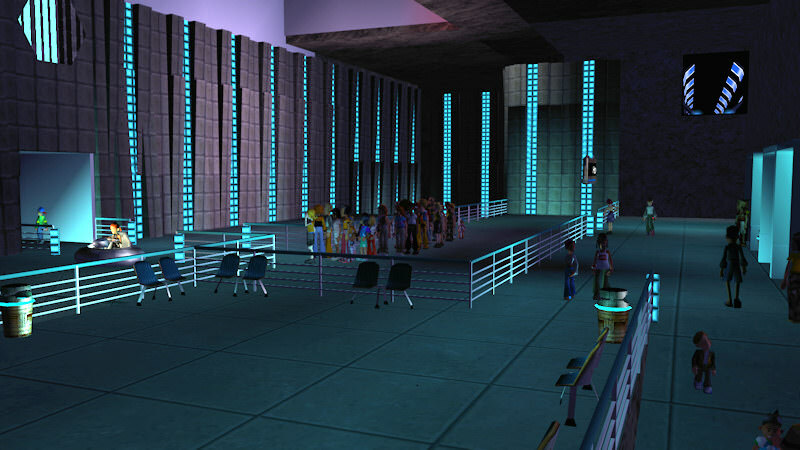 She looks across at the loading dock, "And the line seems to be moving quickly." Wally picks up the pace, "C'mon then. We've got a lot to do and a lot to see!" 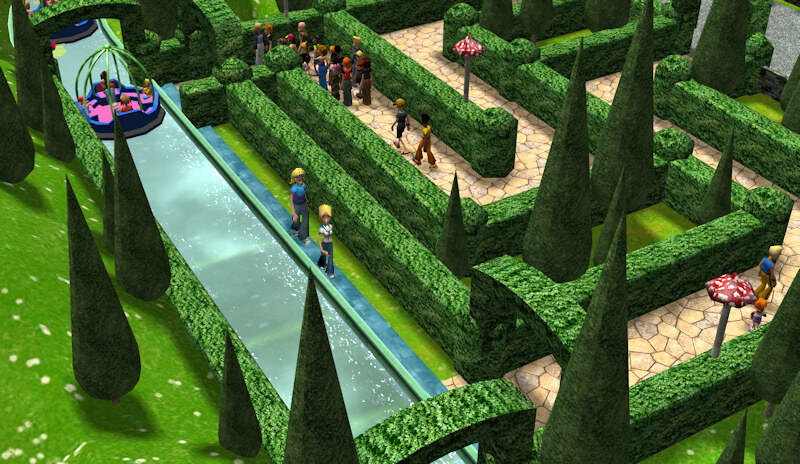 They cross the bridge and go under the castle's portcullis into the tunnel, which passes through the castle and into the park. They can hear spooky music and moaning ghosts filtering slightly through the tunnel walls, "Hey! That must be coming from The Haunted Castle ride," Baxter exclaims. He places his ear to the wall to hear the creepy sounds. 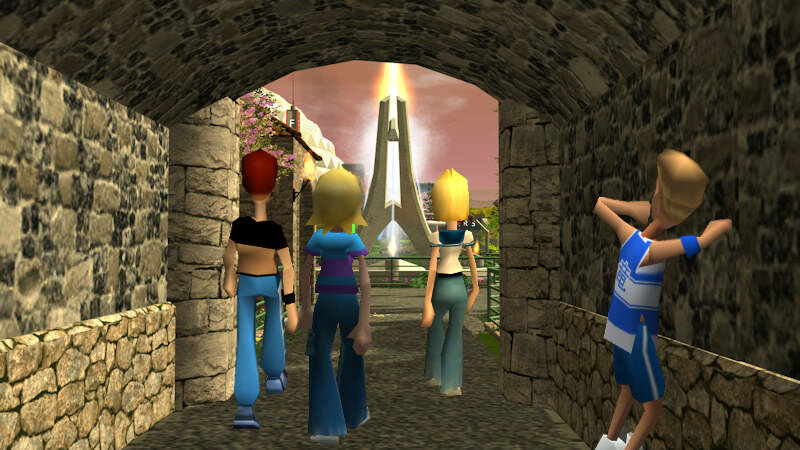 As they emerge from the tunnel, Baxter looks at the fountain in front of them, "Cool, that's just like the scene on the Imaginarium balloon we saw outside the park, only a lot bigger!" Wally spots an Information booth to the left, "Guess we better get a park map so we know where we're going... Don't wanna miss anything, right?" He returns with the map and unfolds it so everyone can see. Wally points to the map, "So, we're right here next to the castle tunnel; the fountain is right in front of us. Where do we wanna go first?" Jill studies the map, "Voyage To Atlantis is off to our right, not far from here. I say we try that first. What do the rest of you think?" "Sure," Baxter begins, "we gotta start somewhere... The Haunted Castle is just to the left, I wanna go on that next!" "And Broom Riders is real close to it!" Tiffany adds. Wally folds up the map, "So it's settled then. We do the subs first then double back this way. We'll decide what to do next after that. We can always split up if we wanna do different things." With that, the Peepertons head for the Voyage To Atlantis queue. What in pure imagination? This looks fun and whimsical and the map really shows the different realms of imagination. I am excited to see more because the name itself is very large and can go in many directions. This is something I know you are going to nail. Awesome job! ^ Thanks cody. And thanks to all who are viewing this thread. 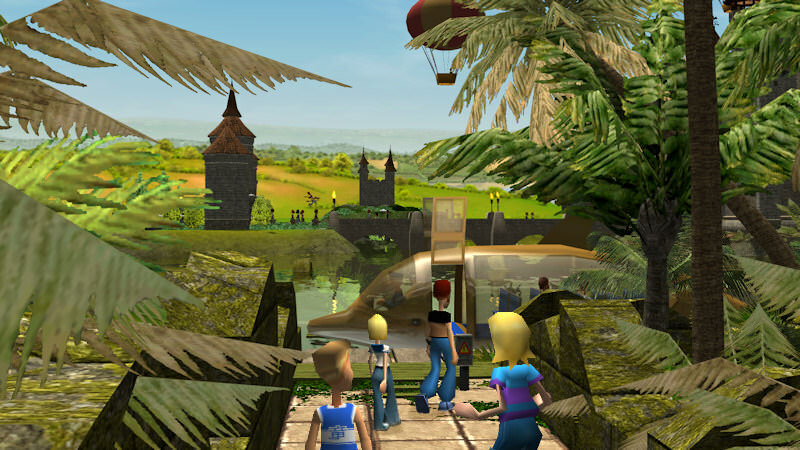 As they make their way to the entrance of Voyage To Atlantis, the Peepertons see one of the Skyway Balloons as it launches from its station and floats overhead. Jill, "Oh, that looks like fun! And safer than those broomsticks... what keeps people from falling off of them, anyway?" Tiffany senses that her mother is trying to dissuade her from going on Broom Riders, "I'm sure it's safe, Mother," she says defensively, "The riders don't fall off." "Yeah, I don't see any smashed peeps lyin' on the ground," Baxter says, helpfully. "That's 'cuz the janitors sweep 'em up before anybody notices," Wally adds with a grin. Tiffany, her nose in the air, "You two aren't helping, y'know." 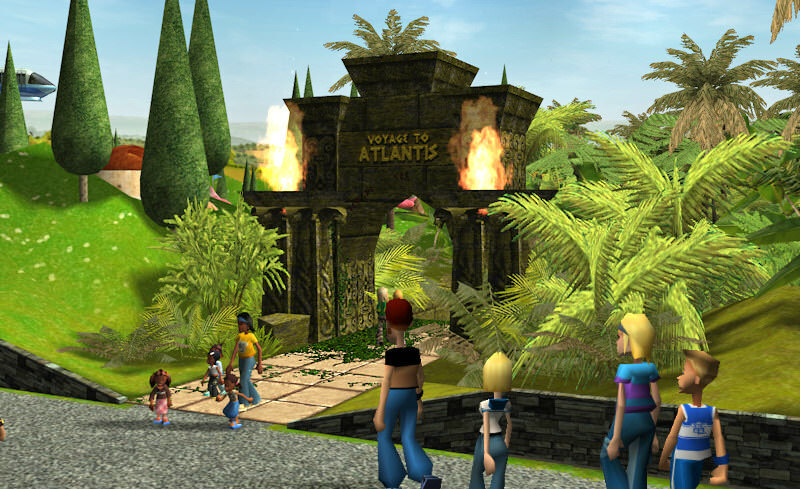 Wally, "Here's the Voyage To Atlantis entrance. If we hurry, maybe we can get on board the next sub before it leaves the dock." "Oh, good," Jill says, "It hasn't left yet." "Just in time," Wally adds as he steps onto the dock. As the Peepertons take their seats, the gull-wing doors of the sub lower down and latch shut. The pilot of the sub turns slightly to face his passengers and begins his well rehearsed spiel: "Welcome aboard the Atlantia, folks. My name is Captain Deucalion and I'll be your helmsman and navigator on this voyage to ancient Atlantis. "The Atlantia is one of four such vessels discovered in an undersea cavern off the west coast of the Azores. These four submarines are the original vessels retrieved from that cave, not reproductions, and are believed to be over 30,000 years old." He lets that information sink in for a few seconds. Baxter's eyes grow wide in amazement, "Cool!" Wally glances sideways at Jill and grins, "Puts on quite a show, doesn't he?" Captain Deucalion turns to face the front viewport once more and manipulates a few ornate levers and pedals. There is a soft whirring sound as the dolphin-shaped vessel inches forward, leaving the dock behind. 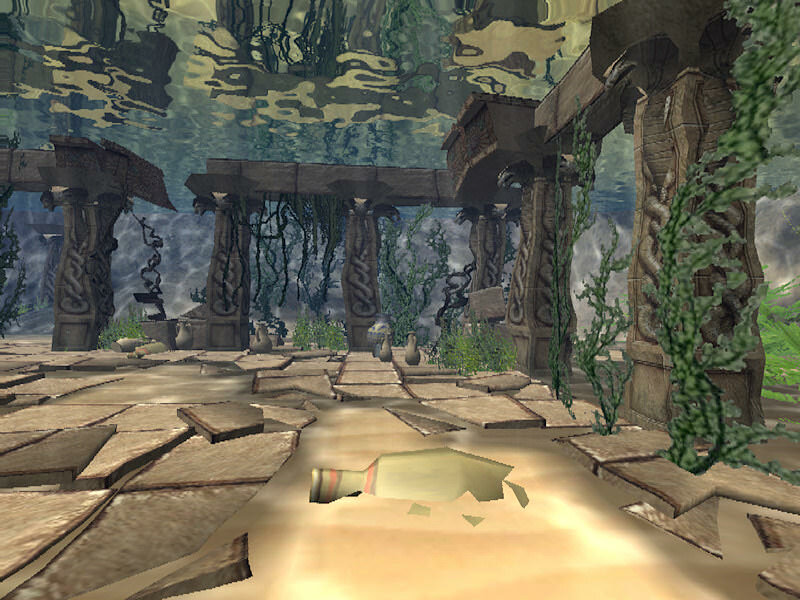 The Atlantia glides along the surface for a while, preparing to submerge. 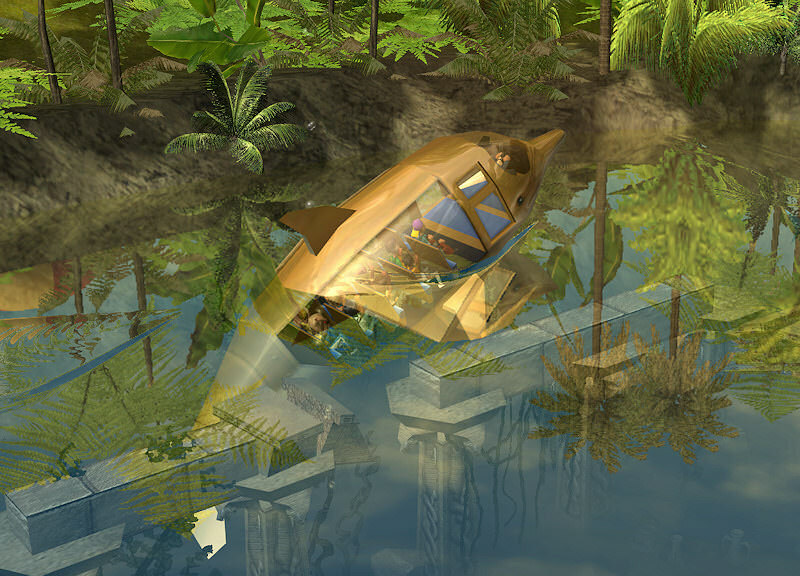 Captain Deucalion continues his history lesson, "The hull of this vessel is pure metallic gold which the Atlanteans extracted from seawater using a long-lost method. They chose gold because, thanks to their technology, it was easy to come by and also because it wasn't affected by the corrosiveness of the seawater." 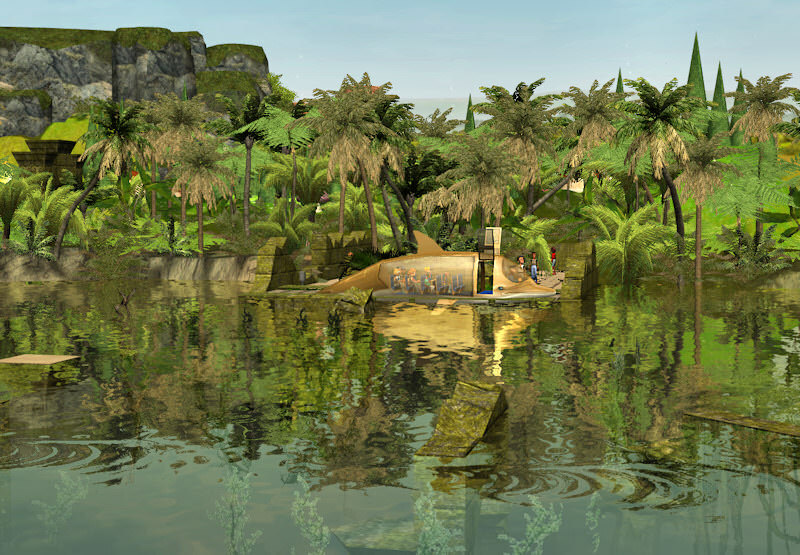 The Atlantia begins to submerge and as the nose of the sub begins to dip below the surface, water starts to fill the interior, "Don't be alarmed by the water entering the cabin, folks," the captain explains, "This is another wondrous example of Atlantean technology. By allowing the water to enter, the pressure is equalized, which keeps the hull from crushing. I can assure you that you will have no trouble breathing, talking, or hearing. Remain calm and breathe normally. A static electric charge forms around everything in the cabin creating a thin envelope of air between you and the water- even your clothing will remain dry." 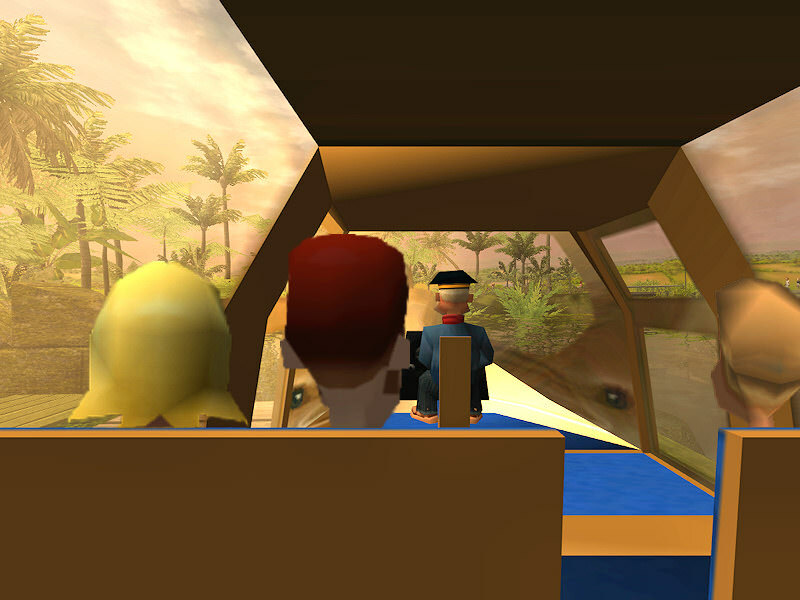 As the water rises, some of the passengers begin to fidget and worry, "Oh, dear!" "Maybe this was a mistake." "I've got a bad feeling about this." Captain Deucalion, who is now completely underwater, reassures them, "Calm down, folks. I've done this many thousands of times and I'm still here to tell about it. Breathe normally." 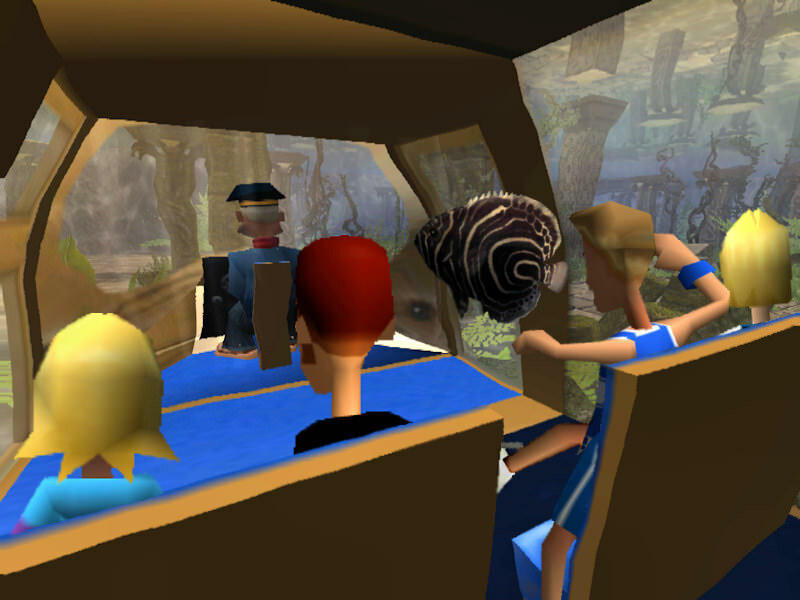 The cabin becomes completely filled with water and the passengers have no choice but to 'breathe normally' as the captain instructed. Wally is amazed by this seemingly impossible feat, "Well I'll be... We can breathe normally. I'm starting to think maybe this isn't just a theme park ride, maybe it's real. Maybe these are the original subs from Atlantis." The captain maneuvers the Atlantia past colorful coral reefs and swaying kelp forests. Baxter lets out a yelp, "Gah! A big fish just swam by my face!... How did a fish get in here?" Wally shrugs his shoulders, "Dunno, Son. Kinda crazy, huh." "Yeah, but still pretty cool!" The captain offers no explanation but has a slight smile on his lips. He continues, "If you look out the front viewport, folks, you can see a multi-colored glow up ahead. We are about to enter an Atlantean crystal garden. 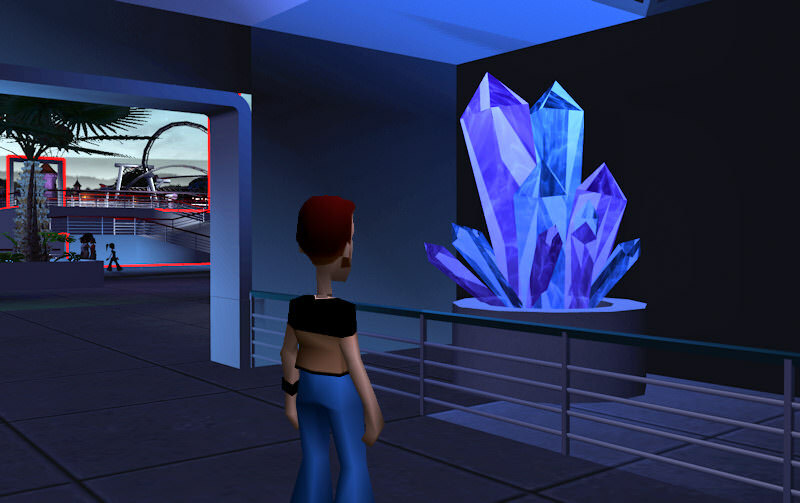 "These glowing crystals contain vast amounts of energy, which the Atlanteans used for powering their machines, heating their homes, and many other uses... This vessel is powered by a small shard from one of the crystals." 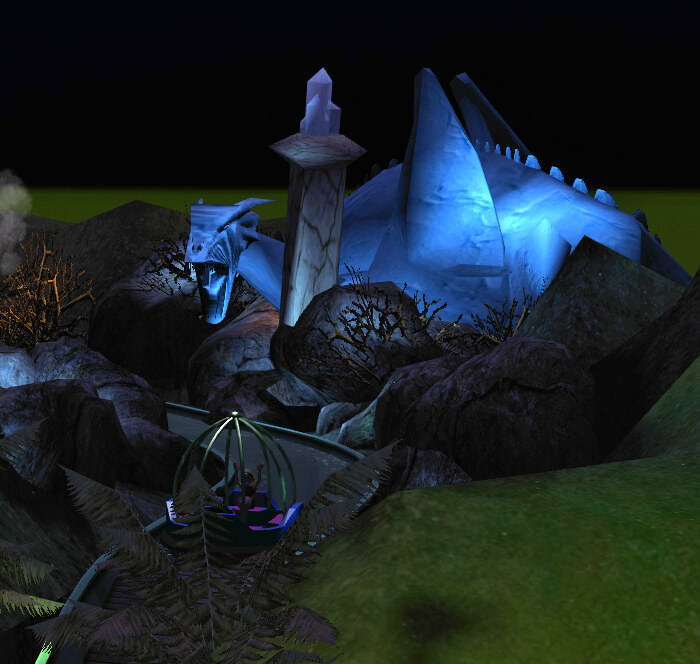 "Here, you see a few of the Fishmen who tend the gardens and stand watch over the crystals. 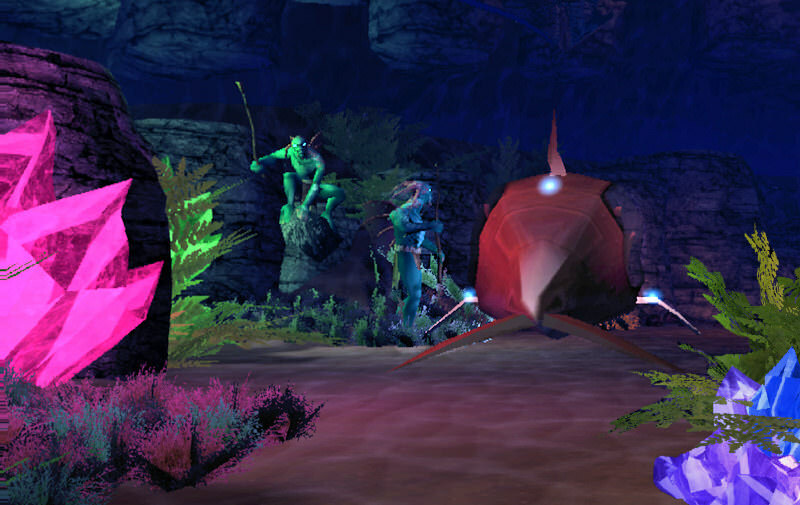 The Atlanteans discovered these ancient aquatic people while exploring the ocean depths. At first the two races were wary of each other but soon developed a respectful relationship. They look rather fearsome, and have been known to attack strangers, but they're familiar with me- we've been around each other for... well, for a long time. The one crouching on the rock is named Gorgul and the one closest to us is Sarkh." Jill gazes at the Fishmen, "Captain, they look alike to me. How do you tell them apart?" "Once you get to know them it's easy to distinguish one from another." Baxter is amused by the Fishmen's names, "Ha, Gurgle and Shark. Just what you'd expect for dudes who live in the ocean." "Careful, lad," the captain warns, "They can hear you. And, they understand English." 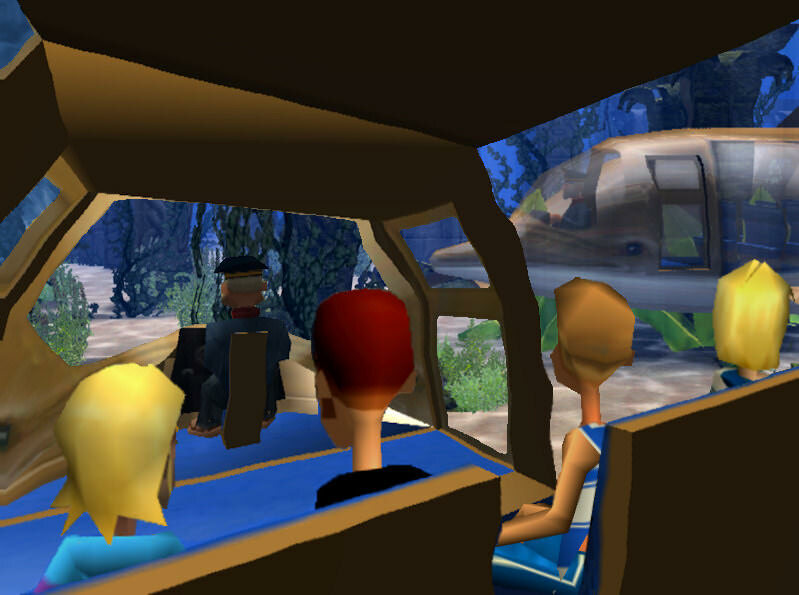 Through the viewport, Sarkh stares menacingly at Baxter, who quickly shuts his mouth and sinks lower into his seat. The captain raises his hand to his forehead in a casual salute as the sub passes the Fishmen, but they remain taciturn and deign not to return the salute; which is their way. As the sub continues on its voyage, an increasingly loud rumbling is heard through the ship's hull and the cabin is imbued with an orange glow. 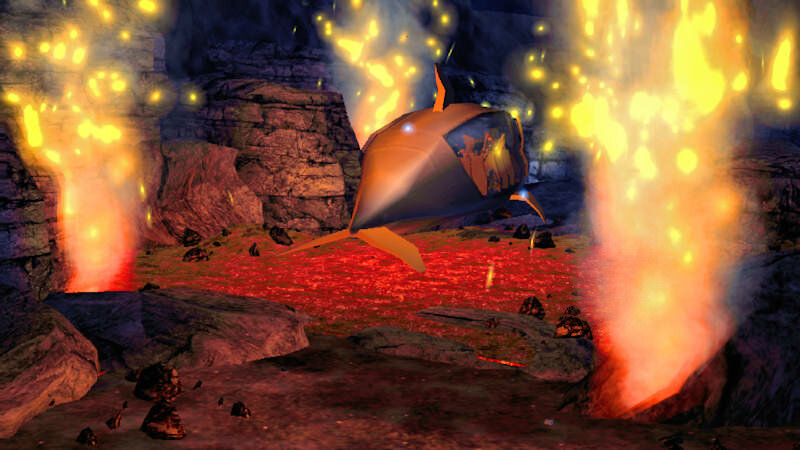 Captain Deucalion, "We are now passing over an active volcanic fissure. The continent of Atlantis was formed by such volcanism and, ultimately, destroyed by it; sending it to the ocean floor." The Atlantia passes above the magma-filled fissure and makes its way around the base of a small seamount, gliding past leaning pillars, green with algae and encrusted with sealife. Captain Deucalion, "If you look to the right, you can see one of our sister ships, the Tritonia, heading toward the crystal garden." "Tritonia, as in Triton?" Tiffany asks, "Isn't that Greek? We're learning about mythology in school right now." Jill expands on her daughter's line of thought, "Captain Deucalion, why would the Atlanteans give Greek names to their vessels? Surely, Atlantis pre-dates the Greek civilization by thousands of years." The captain replies, "You are both correct. Just as the ancient Romans borrowed their gods and myths from Greece, the Greeks borrowed their gods and myths from Atlantis, as did the Sumerians before them. Some names were altered along the way, but they all originate from Atlantis." Jill is perplexed and curious, "Captain, how do you know all of this?" The captain ponders for a moment, "Hmm... Since you ask your question so directly, madam, I will answer it just as directly... I wasn't always 'Captain' Deucalion; in my youth, I was simply Deucalion, an ordinary citizen of Atlantis. And yes, I am 30,000 years old, give or take." Wally isn't buying it, "Oh, now wait just a minute. You can't possibly expect us to..."
"It's the crystals," the captain says bluntly, "I mentioned that they contain vast powers. I, (and the Fishmen), have been in close contact with their eminations since the days when Atlantis was a thriving center of commerce and technology. In fact, the aquatic folk (they don't like the term 'Fishmen') are far older than I am. Sarkh and Gorgul are at least 50,000 years old. And we're not the only ones of our kind left in the world; there are still a few of us scattered here and there." Wally sits speechless and slack-jawed. "Cool!" Baxter says, because that's what he always says when he can't think of anything else to say. 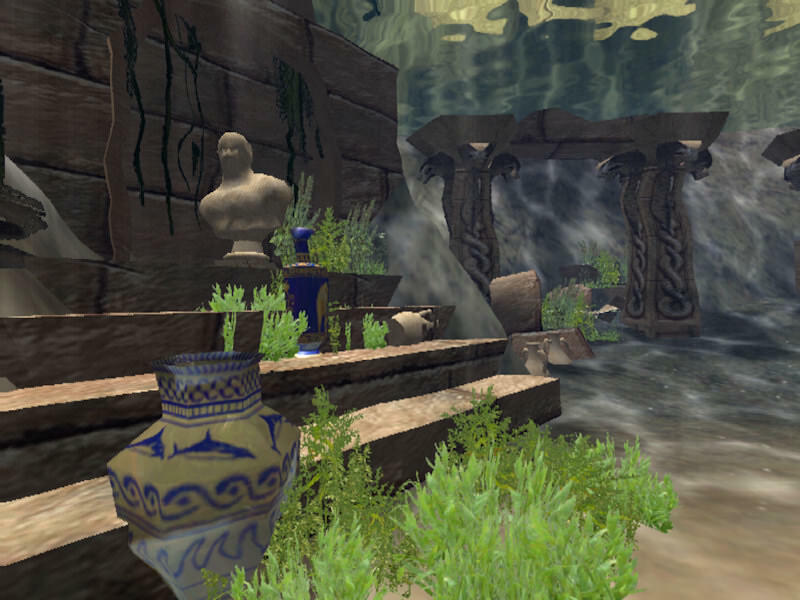 The captain steers the Atlantia through an ever increasing number of pillars and remnants of stone walls, "We are now entering what was once a bustling marketplace in the city of Coranthia; the place of my birth." Wally finds his voice again, "Wait, I thought you said you were a citizen of Atlantis, not here in Cor...whatsis." "Atlantis was the name of the continent, and its largest city. I was born on the continent of Atlantis, here in Coranthia, so yes, I am an Atlantean." The captain continues in a sad sort of way, "These vases, bottles, and amphorae were once filled with grains, oils, and spices from around the world. Now they are homes for crabs, eels, and octopuses. Ah well, at least they still serve a useful purpose." As Captain Deucalion nudges a few levers and adjusts a foot pedal, the nose of the Atlantia tilts upward, "You might want to hold on to your seats, folks; I'm going to power-up the engine as we head for the surface." The whirring of the engine gets louder and the Atlantia speeds upward, breeching the surface. As the water recedes from the cabin, everyone is a little startled; they had gotten accustomed to being underwater; and now they're not- like the sudden silence that occurs after the cessation of a prolonged sound. Baxter looks down and feels his shirt, "Hey, the captain's right; our clothes are still dry, cool!" The sub turns toward the dock and the captain wraps up his spiel, "Well folks, I hope you enjoyed your voyage aboard the Atlantia. And that, from time to time, you'll think back to what you've seen and heard here today and remember that once there was a wondrous place called Atlantis where ordinary people like yourselves went about their daily lives, achieved marvelous things, and explored the seas in these golden vessels." The ship's engine is silenced and the Atlantia coasts to a stop at the loading platform. As the gull-wing doors lift open and the passengers begin to file out, Captain Deucalion turns and waves a friendly goodbye, "Do not forget us." The Peepertons walk toward the exit, a little subdued. Wally is the first to speak, "Well. That was... interesting." "And kinda sad," Tiffany adds. "Yes," her mother agrees, "Sad, but beautiful and majestic, too." "And kinda creepy," Baxter says while looking back over his shoulder, expecting to see Sarkh coming after him. Jill says aloud what the others are thinking, "Do you suppose any of that was true? Is the captain really 30,000 years old?" Wally shrugs, "Who knows... Guess that's why they call this place Imaginarium." 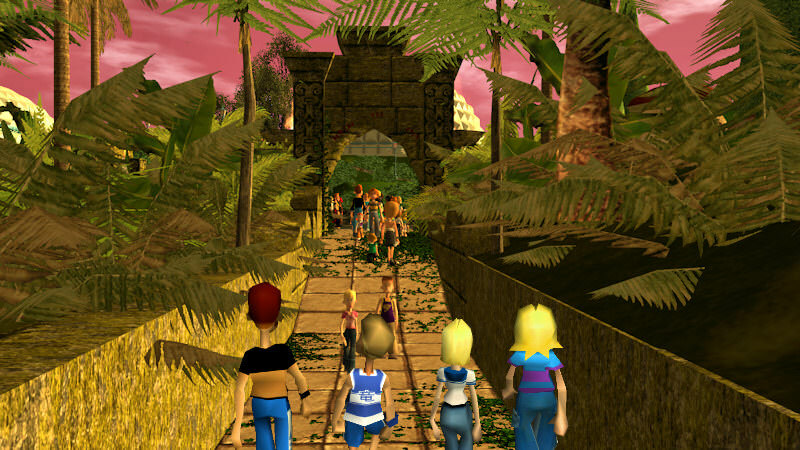 The Peepertons gather just outside the Voyage To Atlantis entrance. Wally, "It's nearly dark; where do we go next?" Jill looks down the pathway to the right, "Ooh, Storeybook Gardens is just a few tiles away. I'd like to go there! How about you, Tiff? We can go on it together." Tiffany, in full snooty mode, "I want to go on something more thrilling than Storybook Gardens." "Oh, come on. It'll be fun. I don't want to go on it by myself." "Oh, all right. But then we're going on Broom Riders!" Baxter, "Don't expect me to go on that fairytale ride thingy. I'm gonna go on FreeFall!" He looks at the towering rocket, even taller now that he's closer to it. He starts to feel his stomach jump and quiver so he quickly looks away, "Yep, that's where I wanna go." Wally, the decision maker, "Well, okay then. You two go on Storybook Gardens and me and Baxter will head for FreeFall." Wally unfolds the park map, "Hmm, if we go back to the fountain and turn right, that should lead us right to FreeFall. 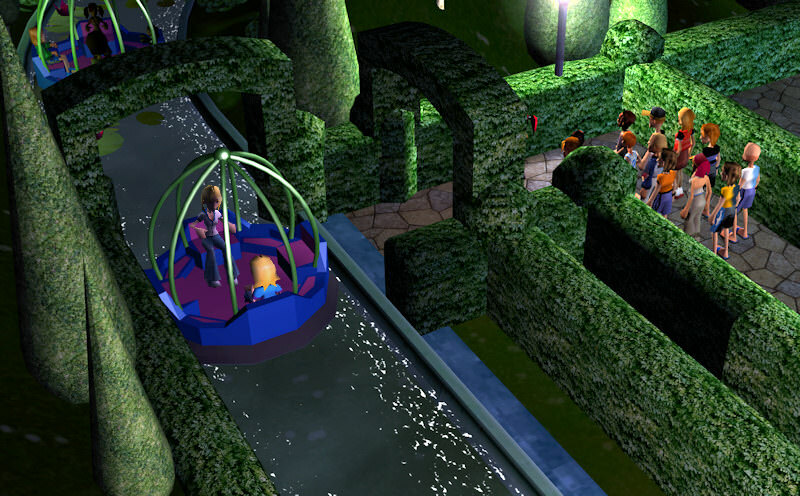 The fountain is about halfway between the two rides. We'll meet there afterwards." 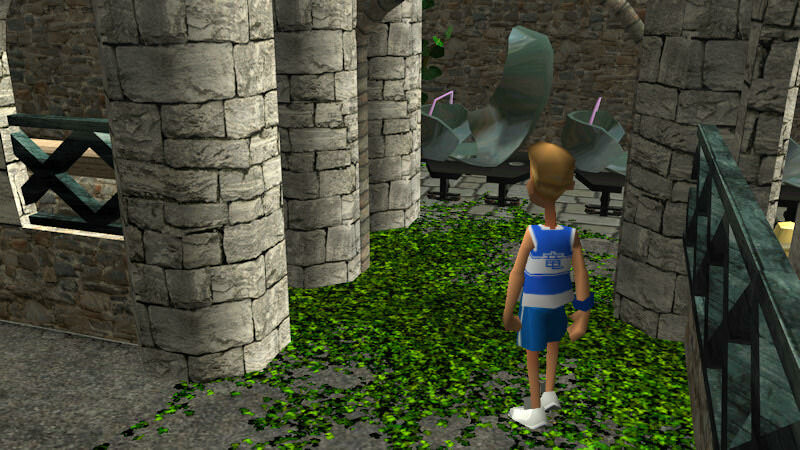 As Wally folds up the map, Baxter takes off running toward the fountain. "Baxter, watch where you're going," his mom admonishes him, "You almost stepped on that small child." Baxter stops in his tracks and sees the little tyke scurrying this way and that, "Geez. Some of these kids are so tiny... about the size of gerbils." He cautiously checks the bottoms of his shoes and is horrified when he sees a ghastly pink splotch on the sole of his sneaker, "Oh, nooo!" he exclaims, "...Oh wait, it's just bubble gum." His mom says what moms always say, "Well, let that be a lesson to you and be more careful from now on." 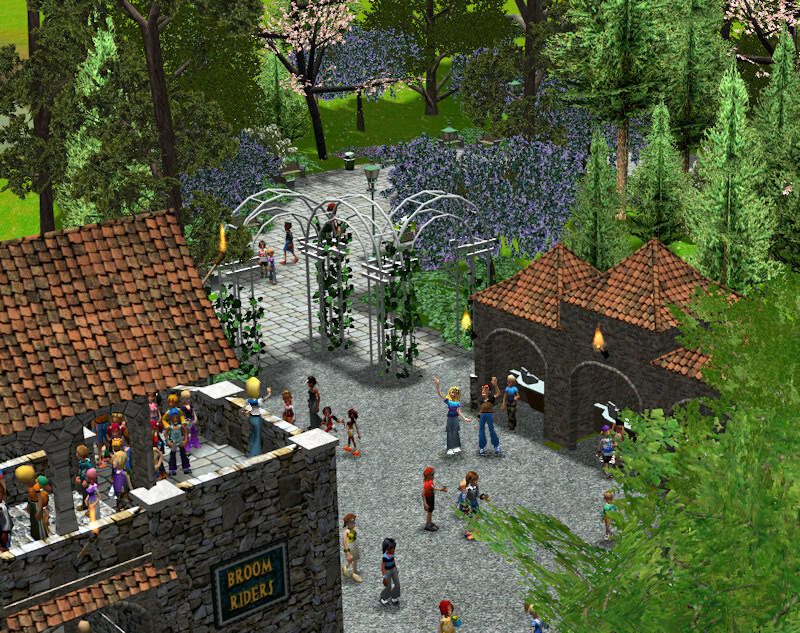 Jill and Tiffany head toward the entrance to Storybook Gardens while Wally and Baxter retrace their steps back to the fountain. Here are a few more 3D pics. Same routine: click to enlarge then cross your eyes to overlap the images. that is crazy how that fake 3-d idea works. "Ooh, Storeybook Gardens is just a few tiles away. 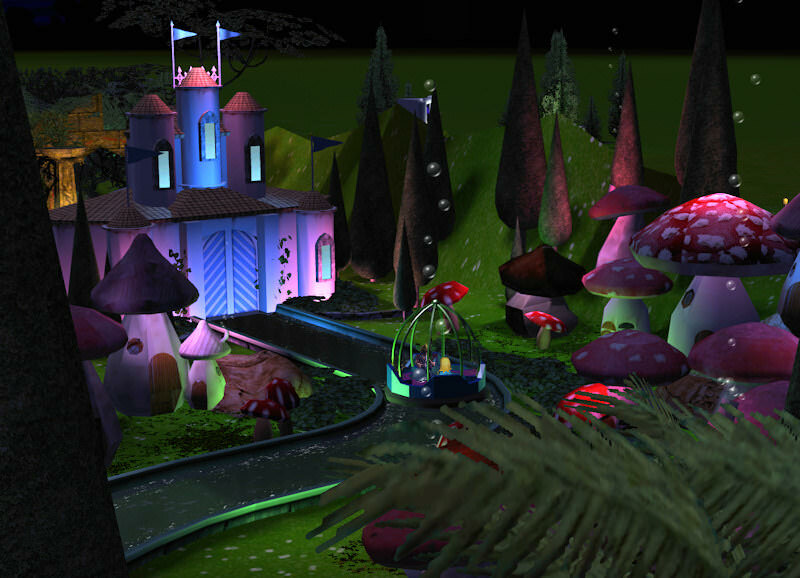 I love love love these stereoscopic screenshots, and the park itself is colorful and intriguing. Great job! I'm glad you like the 3D images. I wasn't sure people would be interested in them (I've been a 3D nut all my life). They're not exactly fake- Put the game on pause and take a screenshot. Then use the mouse-wheel button to rotate the camera just a bit left or right (or press the arrow keys) to get the parallax view, then take a second screenshot. Re-size the pics and place the pairs side-by-side in the same image. I assume the same method would work in Planet Coaster, or any other 3D game. I don't have PlanCo, but it would be interesting to see some 3D pics posted in that Board. Thank you! The story is the main thing, here. The pics, while fun and nice, are secondary to the story and serve primarily to illustrate plot points (a few were included just because they're purty.) I chose/had to skimp a bit on the detailing of this park, trying to cut back on polys, etc to make the game more stable/less likely to crash. So it's not the most-est, best-est, knock-yer-socks-off park around. I'm better at writing than park building (says I), so I'm writing a fun and interesting story to distract you from the park's shortcomings. I'm trying to include as many of the game's 'oddities' as I can think of, so you'll be seeing a lot more of them in coming installments. That's basically what this story is about. Thanks! 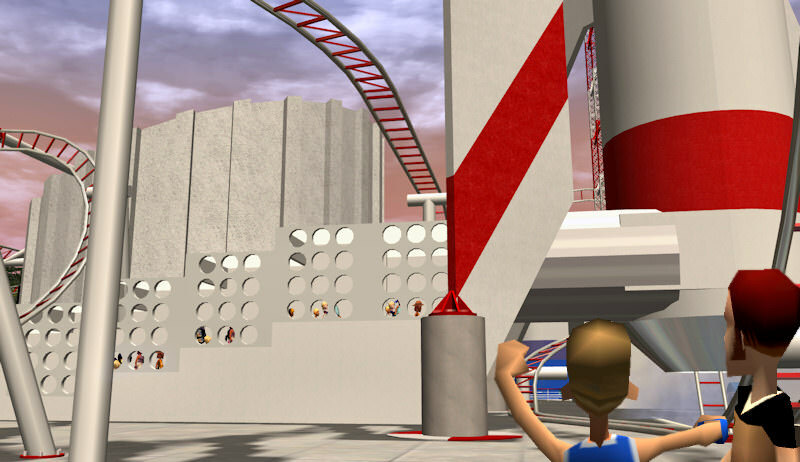 Well actually, you probably have seen this kind of RCT3 storytelling before- shyguy's Wonder World and Water World parks tell quirky stories that utilize the game's many pluses and minuses. I'm taking my cue from him. And yes, there are (at least) 5 or 6 more installments already written. But the story is still only about half done, so there's lots more to come. This just gets even more impressive with each post. Well done! Wally and Baxter approach the Imaginarium fountain once again. Baxter, "The fountain looks even cooler at night, all lit up like that... Oh wait, I just remembered I was going to go on The Haunted Castle next." Wally, "Maybe you should go on FreeFall first. 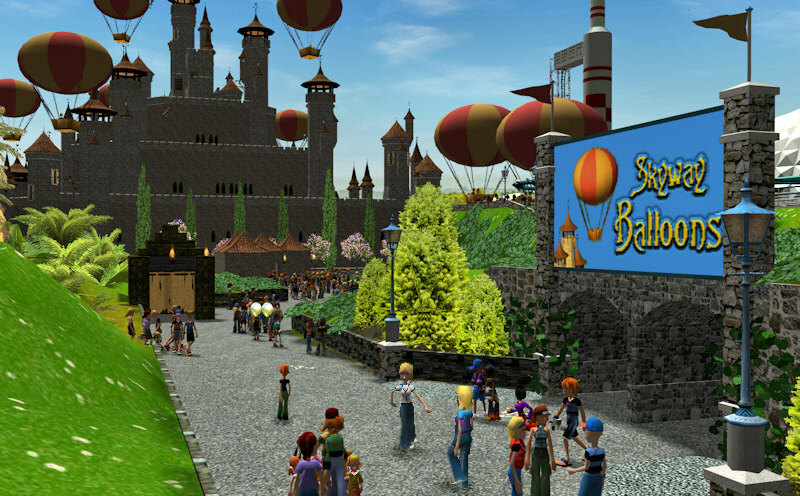 Tiff wants to go on Broom Riders, which is right next to your Haunted Castle. Each of you can go on your own ride at the same time. It'll work out better that way." "Sure. C'mon, lets go!" Baxter says eagerly. The two of them head for FreeFall. 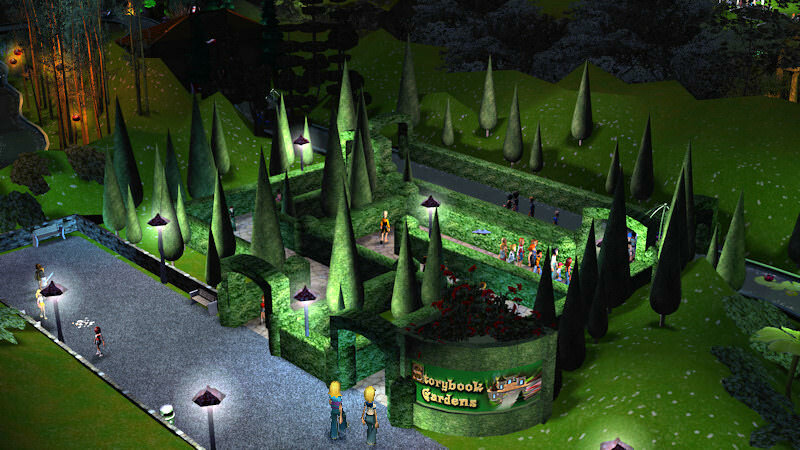 Jill and Tiffany arrive at the entrance to Storybook Gardens, "Oh, aren't these topiaries wonderful?" Jill says to Tiffany. "I guess," Tiffany replies with zero enthusiasm. She just wants to get this 'kiddie ride' over with so she can 'go on something more thrilling'. 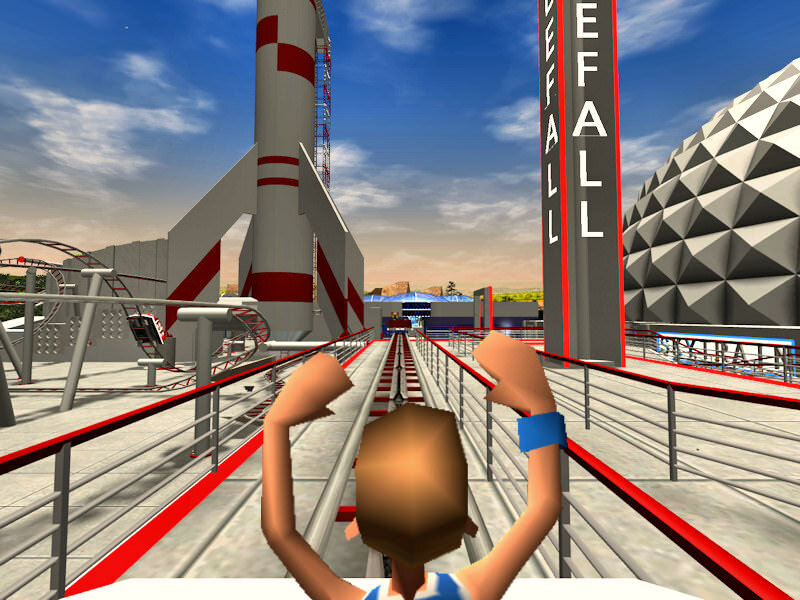 At the entrance to FreeFall, Wally looks up at the gargantuan rocket, the loops, the barrel rolls, and overbanked turns. They hear screaming as a car plummets straight down the inside of the brightly lit rocket, "I dunno, Baxter," Wally says, "FreeFall looks too intense for me." "Aw, Daaad." Secretly, Baxter is as terrified of going on it as his dad, but he's not about to admit that to anyone. "But you go ahead and get in line, Son," his dad says cheerfully, "I know how much you've been looking forward to going on this ride. Besides, I need to use the 'little peeps' room. I'll meet ya back here after I use the restroom, okay?" "Yeah, sure." Baxter says in an emotionless way. He begins his trek up the ramped queue with a mixture of excitement and doom; like a condemned prisoner climbing up to the gallows where the noose awaits him. Wally unfurls the park map, "So, the restroom is... through the Sky City entrance just ahead, down the elevator, second door to the right and straight on till morning." He folds up the map and heads for the entrance to the Sky City dome. 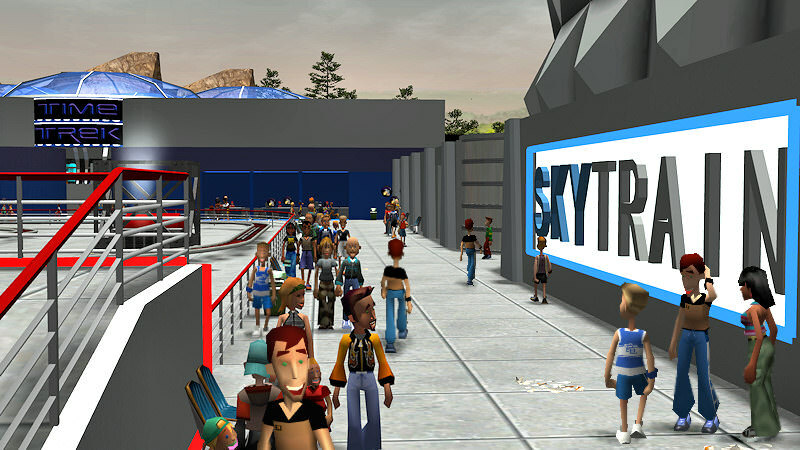 Baxter is standing at the front of the FreeFall queue waiting for the next car to arrive. He looks out at the complex maze of red and white track, "Cool!" His eyes eventually lead to the impossibly huge rocket. 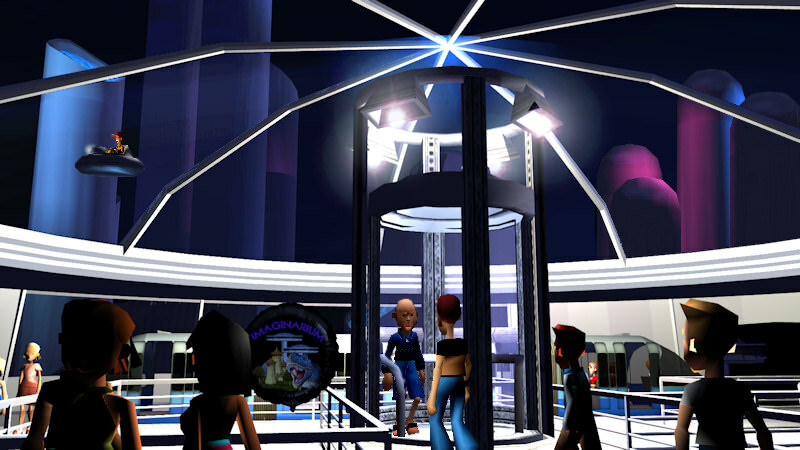 He looks up, and up, and..."
As Wally goes through the glowing futuristic corridor into the Sky City dome he hears an announcement over a nearby loudspeaker: "[click] Will the nearest janitor please report to the FreeFall station. 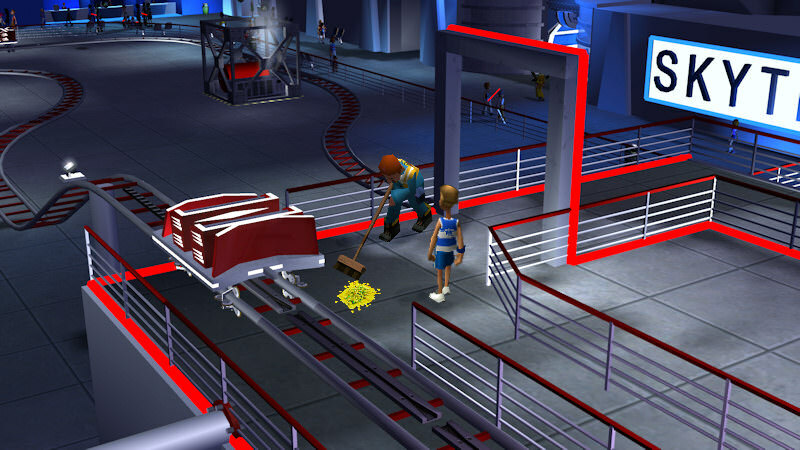 Repeat, we nead a janitor at FreeFall- bring a mop and bucket. Thank you. [click]"
Wally sighs, "And the 'Human Geyser' erupts again... That's my boy." Jill and Tiffany step into one of the Storybook Gardens canalboats, "Aren't these boats beautiful," Jill says, "They remind me of Cinderella's carriage." "They look like birdcages to me," Tiffany says, looking down to see if there are any newspapers lining the cage floor. 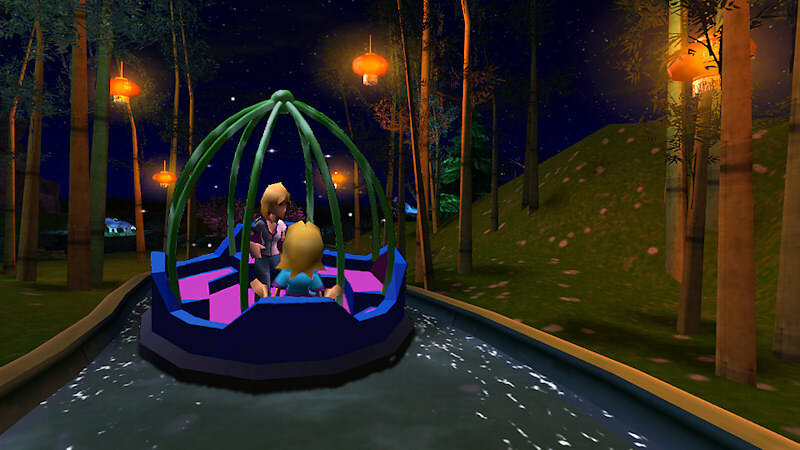 As they begin drifting down the Storybook Gardens canal, Jill is overflowing with enthusiasm, "Isn't this wonderful? It's like we've been reduced to the size of mice; floating under shamrocks and now through this gnome village. Aren't these mushroom houses cute?" "Mm, hmm," Tiffany replies, clearly not overflowing with enthusiasm. As they round a turn, a fairytale-ish castle comes into view, "Oh, that castle looks beautiful all lit up in pink and blue, " Jill gushes, "And look, the castle doors are opening for us. How clever!" The canalboat drifts through the archway just as the castle doors close behind them, "I wonder what's next," Jill says excitedly, "Maybe a knight in shining armor or the Seven Dwarfs house!" Tiffany is bored to tears and has heard as much of her mother's gushing as she can stand, "Mother, I..." Just as she is about to launch into what is sure to be a hurtful argument, she begins to hear menacing jungle drums and the roar of rushing water. 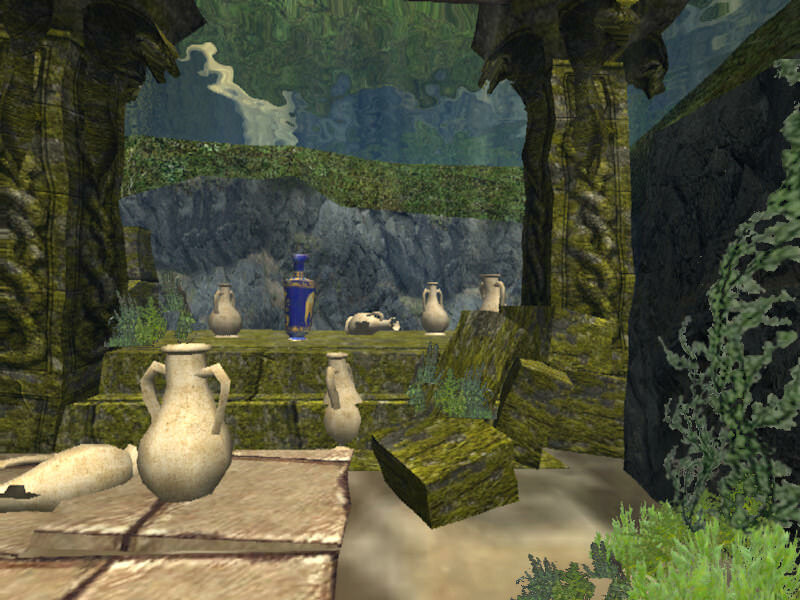 The boat approaches an ancient moss-covered stone arch covered with carved snakes and strange writing, "Oh my," Jill says worriedly, "this doesn't look like the Dwarfs house at all... and those drums are a little scary... and what's causing that roaring water sound?" Tiffany senses that the ride is about to get more exciting, "I don't know, but it's getting LOUDER!" She says with a mischievous grin. Just then, the boat slips over the edge of a steep 32 foot drop, "Eeeek! Ahhhhhh!" Mother and daughter scream all the way down; Jill with terror, Tiffany with joy (and a little terror). The boat makes a loud [sploosh] as it reaches the bottom of the drop, then resumes its slow drift down the canal. Jill and Tiffany find themselves in a narrow ravine surrounded on both sides by monoliths carved in the shapes of huge cobras. Hanging vines and moss sag from the dense canopy of trees overhead. The drums and roaring water have given way to a loud chorus of night insects. Jill has lost her bubbly enthusiasm, "This isn't what I thought the ride would be like at all! Where are the faeries, the unicorns, the mermaids?" "Oh, Mother," Tiffany the know-it-all says, "I think this is the best part of the ride so far. All fairytales have a dark and sinister side; the Evil Queen wanted to cut Snow White's heart out, right?" "I suppose," Jill agrees, reluctantly, "But I still don't like this." "EEEK!" Jill screams, "Those snakes in the trees are moving! Are they alive? Are they real? I don't like this at all!" Tiffany knows the snakes aren't real, but she lets her mother fret over them anyway, "They look real to me... I bet they've eaten at least a dozen peeps just today!" The canalboat begins to climb out of the ravine to whatever awaits it next. Jill is relieved, "Oh, thank the Gamer we're finally leaving those snakes behind. I'm sure we'll get back to the pleasant and beautiful part of the ride now, don't you think?" Tiffany sighs, disappointed to be leaving the exciting part of the ride, "I suppose. 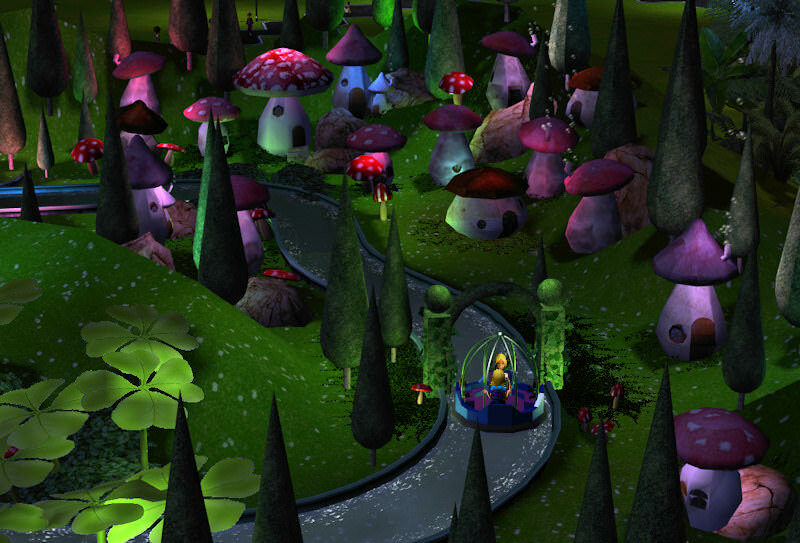 Back to the gnomes in their cute little mushroom houses," she says sarcastically. Available exclusively to viewers of this thread only! All others will be turned away. In lieu of a cover charge, a $5 donation may be made to the 'Feed the Gerbils' foundation. Proof of purchase required. Must be over 18 or under 19 to enter. Prohibited where prohibited. I've always been a sucker for fairy tale boat ride, There's something so magical about the whole idea. I'm not too sure how feasible a 32 foot drop would be in those rafts, but this park isn't built on realism. I'm not too sure how feasible a 32 foot drop would be in those rafts, but this park isn't built on realism. Bingo. 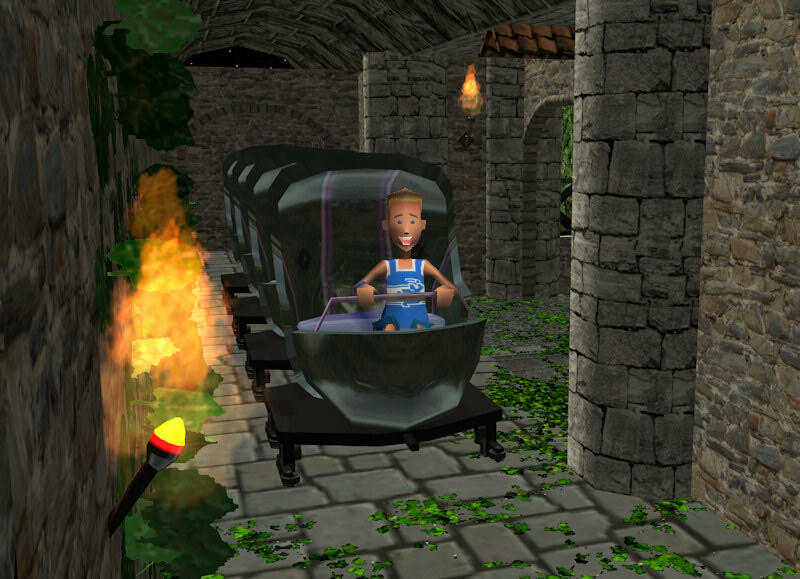 I'm not too concerned about real-world realism (or the laws of physics), as you may have guessed from the flying monorails and broomsticks, etc. Although, doesn't Splash Mountain have an even bigger drop? There's not much to hold the guests in those logs; ditto, these fairytale boats. They do seem kinda top-heavy though, don't they. I don't know how I missed this, but I'm loving it so far. Too bad I can't get the 3D pictures to work. I can't wait to see more. I love that submarine ride. I don't think I've seen that CTR before. I'd love to host it at the CS Depot (hint hint). Thanks shyguy. Not sure why the 3D pics aren't working for you (unless there's a physical reason- you need 2 eyes in working-order to perceive depth.) I find that it helps if you isolate an obvious object in the pairs of images, say, the fairytale boat in the last 3D pic posted above. Cross your eyes till the boats overlap completely; the image should spring into 3D then. Some people hold a finger up close to their face, about 6 or 7 inches, focus on the finger, then lower the finger while keeping your eyes focused in the same plane. I think it's easier to just cross yer eyes though. 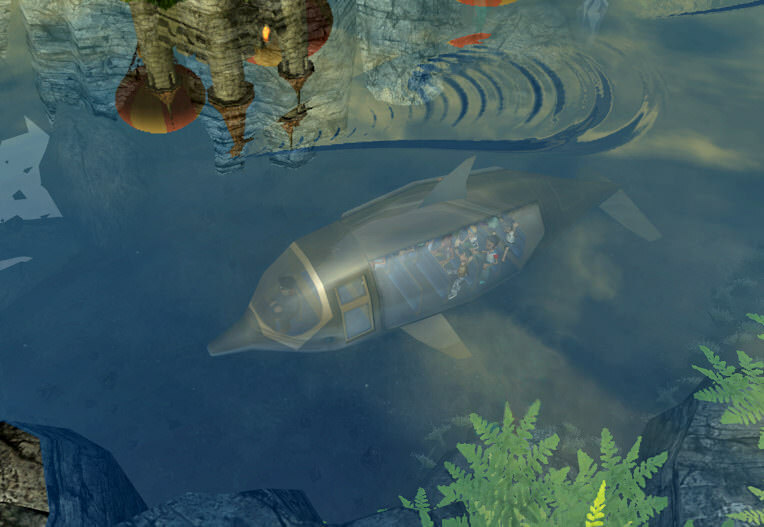 The submarine is just the in-game dolphin shaped water-transport (?) boat that I stuck onto the RR invisible track. Wait a minute, did you "steal" the balloon on free balloon day at my park? Fun photos to go along with your "whimsical tale," and I just love the different areas. Well done! cody: Yep. I had a bunch of 'clear balloons' on my hands that I needed to get rid of. So I absconded with several cases of your Mouse ear balloons from Disney Dubai, stuck one balloon inside the other and wallah, a twofer! Now, I'm having a free balloon day. 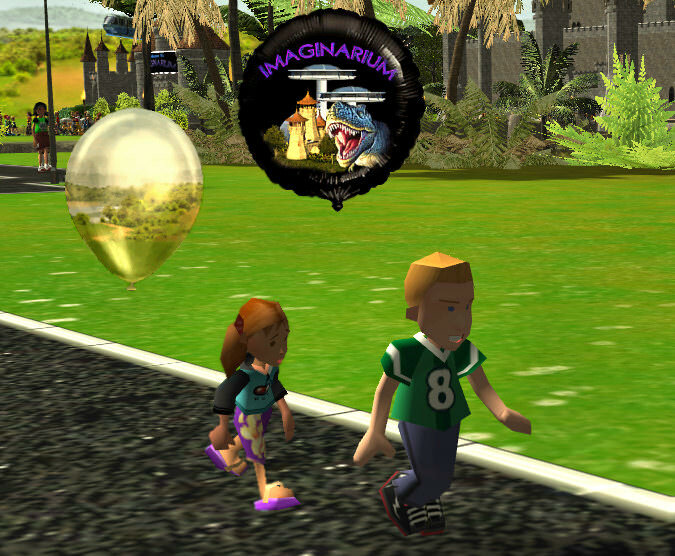 Actually, every day is free balloon day in Imaginarium- and free everything else day as well; I don't charge for stuff in the park. Maybe I should though- it gets annoying hearing all the peeps say how everything 'is a really good value'. I know the struggles! I am trying to do refurbs around my parks to create smoother transitions and make sure there are not many eyesores to ruin some themes. still amazed how those 3d photos work. THIS IS EPISODE 4. IF YOU WANT TO READ THE STORY FROM THE BEGINNING, THEN TURN AROUND AND START WITH EPISODE 1. THIS IS EPISODE 4! * Blatantly ripped-off (paraphrased) from the soundtrack LP of 'Monty Python and the Holy Grail'. "Sorry about the mess," Baxter says sheepishly as a janitor cleans up the puddle of yeeurghh. "No problem, kid," the janitor replies, "Happens all the time... only, they usually puke after the ride, not before." Baxter's face turns red from embarrassment as he boards the FreeFall car, "Guess I ate too much junk food," he says lamely. The car inches forward and rolls down a small drop, giving it the momentum it needs to get through the first leg of the track. Baxter's mood picks up as the car rolls slowly past tanks of hissing gasses, odd pieces of humming machinery, and around the huge fins of the rocket. On his way to the 'little peeps room', Wally enters the Sky City Elevator and sees a forlorn and angry looking man. As they wait for the door to slide shut, Wally strikes up a conversation, "Hey, old-timer. How's it goin'?" "Old-timer?," the man replies, "Why, I'm about the same age as you... maybe younger!" Wally studies the man more closely, "Sorry. But you look a LOT older." "Hmph... So would you if you'd been stuck in this elevator for as long as I have." Wally seems truly puzzled, "Well... How long have you been in here, old-ti..." He catches himself just in time, not wanting to get the guy any angrier. "What year is this?" The elevator guy asks. "I said, what year is this?... It was year 12 when I entered this golldurn contraption. What year is it now?" "Year 23?! Hokey smokes! You mean I've been in here for 11 years? ... I gotta pee REAL bad." "Well, why don't you just leave?" "I can't," the elevator guy states matter-of-factly. Wally is totally flummoxed and getting a little annoyed with the man, "Now, see here. The elevator door is open... why don't you just walk out?" To prove his point, Wally steps out and back in again, "See?" The elevator guy looks at Wally uncomprehendingly, "I told you... I CAN'T!" As the elevator door slides shut, Wally concludes that the guy is probably a few bits short of a byte. He rides the elevator down in silence. 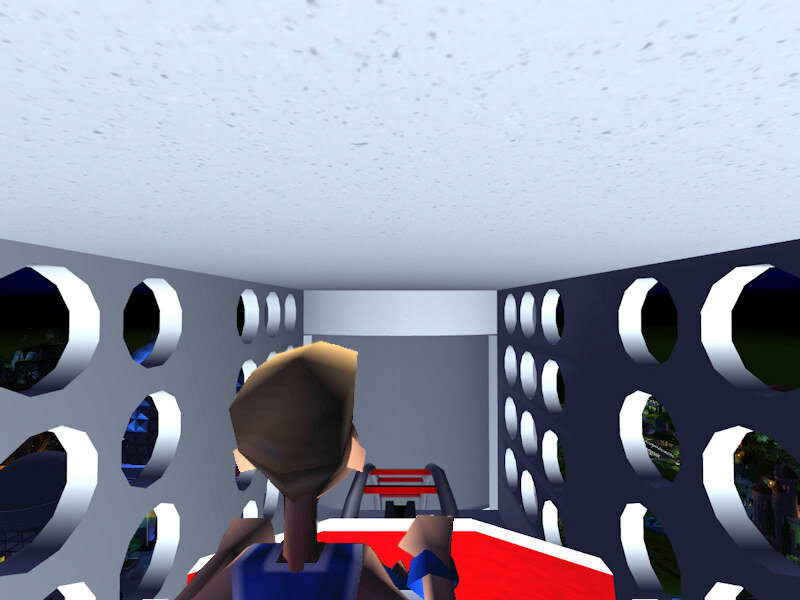 The car reaches the lower level of Sky City and the door opens once more. As Wally exits the elevator he looks back at the forlorn guy and tries one more time, "Come on, just step out the door." The guy gets angry again, "I TOLD you, I CAN'T!...... I really gotta pee." The elevator door slides shut and the car starts rising to the upper deck again. Wally shakes his head and continues on his way to the restroom. The Storybook Gardens canalboat climbs to the top of the ramp, leaving the ravine with its snakes and carvings behind. Jill and Tiffany are met with a bleak and blackened landscape, "Oh dear," Jill frets, "not a mushroom house in sight." "No. But there is that thing!" Tiffany says with glee. She points to a ferocious looking blue dragon just ahead, "All riiight, a dragon!" she says cheerfully. "Oh nooo, a dragon?" Jill says, fearfully. As the boat creeps nearer, they hear guttural hissing and bellowing coming from the dragon. Jill glances anxiously around the area, "Where are the pixies, the elves, the... Eeek!" She shrieks as the dragon breathes a huge ball of fire over their heads. "Oh, look Mother, another one!" Tiffany says as a red dragon comes into view. "Another one? Oh, no, no, no, no," Jill repeats, as if to ward off the threatening beasts. "Ooh look, " Tiffany points, "A burning skeleton- a cow or something. Maybe the dragons are fighting over it... And look! We're going to go right under the red dragon's belly!" "Oh, surely not!" Jill exclaims. She partially covers her eyes to avoid seeing the giant lizard. "Cool!" Tiffany says, sounding a lot like her brother. 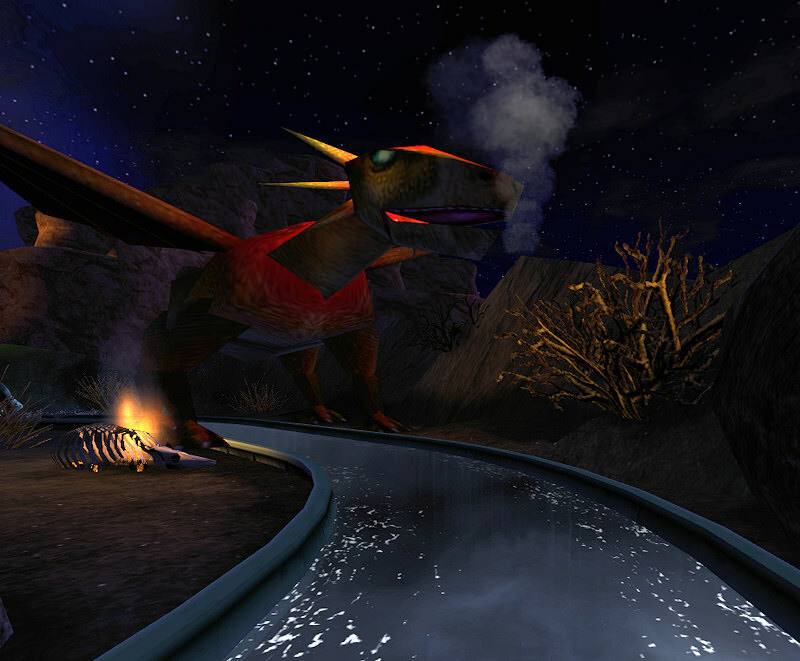 The boat drifts slowly (too slowly for Jill) past the dragon's underbelly and around a bend in the canal. The blue dragon turns his head toward the red dragon, "I say, what was that woman going on about, old chap? Was it our barbequed beef there? I would have offered her some but she seemed to be in quite a state." The red dragon responds, "Hmm. I rather think it was us she was averting her eyes from, dear sir." "Indubitably!" the red dragon replies. He looks at the burning carcass, "I do believe our beef is ready... I say, I could do with a spot of tea. Be a good fellow and fetch some of that Darjeeling you keep stashed away, yes?" 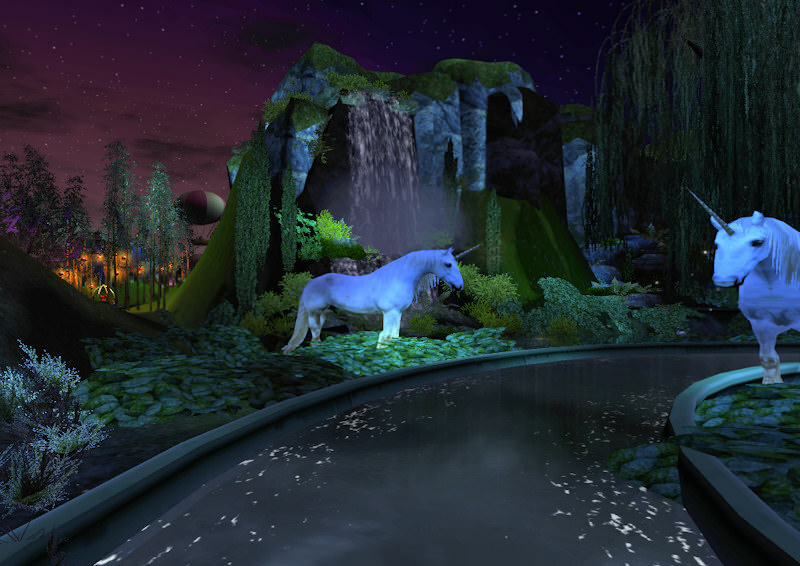 As the blue dragon flies off to his lair to fetch the Darjeeling tea, the canalboat drifts into a more inviting landscape, "Weren't unicorns on your list of things to see, Mother?" Tiffany asks, "Because there they are; two of them!" "Oh, thank goodness," Jill says with relief, "FINALLY we're back to the pleasant part of the ride... And aren't those the most beautiful unicorns you've ever seen?" "I suppose." Tiffany replies glumly, "Then again, I've never actually seen any other unicorns, sooo..."
"And look!" Jill says excitedly, "Faeries!" The boat winds its way past a picturesque pond fed by a magnificent waterfall. The faeries dart and flit overhead leaving trails of dazzling incandescence. White swans float lazily in the pond under the moonlit sky. As the boat passes under willow trees aglow with fireflies, Jill is back in her element, "Oh, my. It's so beautiful here; the faeries and fireflies, the waterfall splashing on the rocks, the swans..."
"...the cave," Tiffany adds, pointing to the opening just ahead. "What? Oh no. Not more snakes and dragons, please." "Hmm. I would guess probably trolls or goblins." The boat drifts closer to the cave entrance, "Ooh," Tiffany says, "It looks like we're headed for another drop!" "Not again." Jill braces herself. Much to Tiffany's disappointment (and Jill's relief), it turns out to be a short and gentle slope, barely noticable. The canalboat slides down the slope without so much as a splash, "Oh, that was rather fun," Jill says, "But where are we now?" "Mermaids!" Jill exclaims with delight. Two mermaids are basking on the rocks, filling the air with their melancholy songs. "Let's see- " Tiffany begins, "fareies: check; unicorns: check; mermaids: check. Looks like your list is complete, Mother." "They look beautiful," Jill says, "but kind of sad, don't you think?" "Well, of course we're sad," the nearest mermaid says. "Oh my!" Jill exclaims, "They talk!" The mermaid continues, "You'd be sad too if all you did all day, every day, is sit on these slimy rocks and sing!" Jill suspends her disbelief that she is speaking with a mermaid and continues the conversation, "Surely, there must be other things you can do to fill the time?" "Nope," the mermaid says, "Just sit and sing, and sing and sit... Oh, once in a while one of the faeries will fly in here from outside the grotto. But have you ever tried having an intelligent conversation with a faerie? They're such tiny creatures there's no room in their itty-bitty brains to remember anything. They fly from here to there, then forget where they just came from and fly back to where they started, thinking it's someplace new! Gawwd! They're like, the dumbest things on the face of the Earth." The mermaid loses interest in the conversation and begins singing again. The canalboat drifts around to where the other mermaid is sitting. She holds her hand up to her brow and squints into the distance, looking for something, "Have you seen my handsome sailor? He said he would be back to take me away with him, but it's been ages and he hasn't returned." "Um, no I haven't," Tiffany replies. "My sister over there says I'm being stupid, expecting him to come back, but I've got nothing else to do." She squints into the distance again, looking for her handsome sailor. "Well, if you had legs you could look for him yourself," Tiffany suggests helpfully. "Legs?" the mermaid asks, "Oh, you mean those spindly stick-things you people have. No thank you, I'd much rather have my beautiful shiny tail." Tiffany thinks the mermaid is being unreasonable and a little rude, "If you went looking for your boyfriend you wouldn't get very far on that fishtail of yours. You can't even walk!" "Walk?! You mean like crabs do? Eeeeww, gross! My tail is much better than your stick-things." As they leave the mermaid behind, Tiffany stands up in the boat and yells through the bars, "Fine! Keep your stupid tail. It's scaly, it's slimy, and it's STINKY!" But her tirade falls on deaf ears, as the mermaid has stopped listening and is singing again. The boat climbs up the short ramp out of the grotto and drifts through a stand of bamboo festooned with colorful paper lanterns. Jill glances sideways at her daughter, "Hmm, that mermaid reminds me of someone," she says with smile. "What, you mean me?! I don't act that way at all, Mother. I..."
Tiffany is cut short when a faerie darts through the bars of the canalboat and flutters near their faces, "Been talkin' with the mermaids, I see," she says in a squeaky voice, "It didn't go well, did it?" "Uh, no. It didn't," Jill says hesitantly. The faerie continues, "They're impossible to talk to- the seawater has pickled their brains, you know. All they do is sit and sing. Tragic, really." "Um," Jill begins reluctantly, "They said that you were difficult to talk to, because of your... small brains." She trails off at the end, becoming suddenly embarrassed. "Pshh. That's just like them," the faerie says, "They think that just because we're so tiny compared to you Giant Folk that we can't have complex thoughts." Jill feels the need to apologize to the faerie, "I'm sorry if I offened y..."
"Ooh!" The faerie interrupts, gazing out through the bars in the same direction from which she just came, "I don't think I've been that way before. I wonder what's over there!" She flits out of the boat, leaving a sparkly trail behind. Tiffany is left slack-jawed and confused, "I don't know which story to believe: the mermaid's or the faerie's, or both." 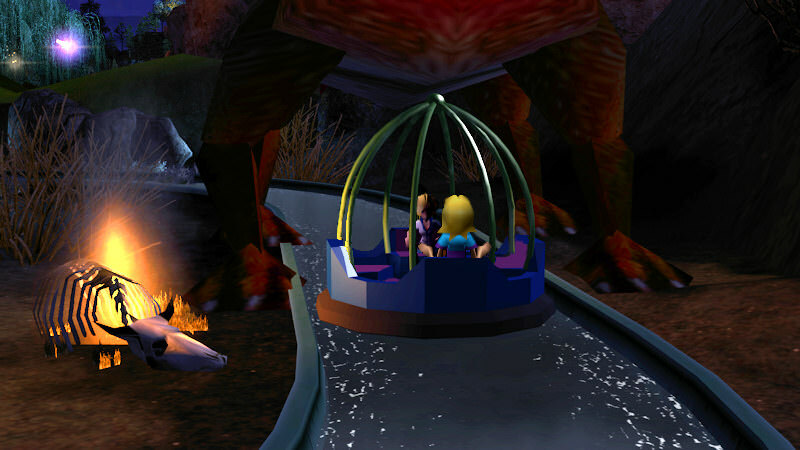 "Or neither," Jill adds, just as confused, "I guess things aren't always what they seem in this park." "At least we agree on that point, Mother." Do not view EXTRA STUFF if you are allergic to EXTRA STUFF. Symptoms may include: headache, drymouth, vomiting, and pregnancy. Side effects may include: baldness, blindness, deafness, and death. If side effects persist, see you doctor. SGW and JB are not responsible for symptoms or side effects. Ask your doctor if EXTRA STUFF is right for you. The following is an unpaid advertisement. Click to enlarge. More eye candy. 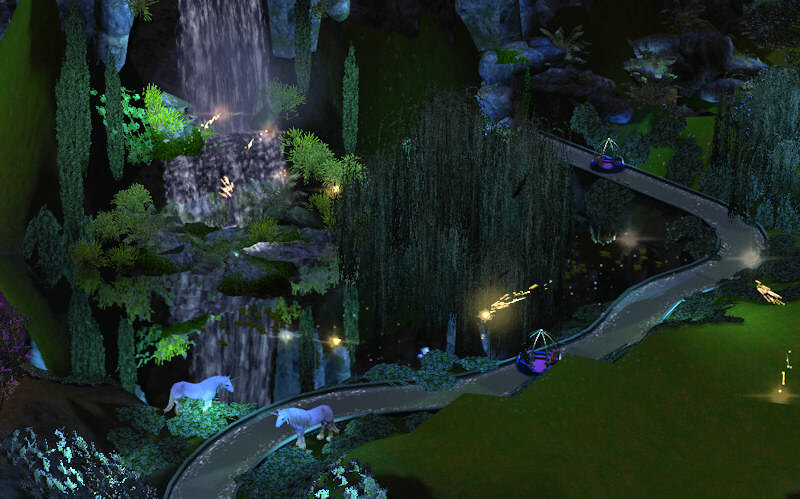 I especially like the scene with the unicorns and the scene with the lanterns. But that advertisement is priceless! 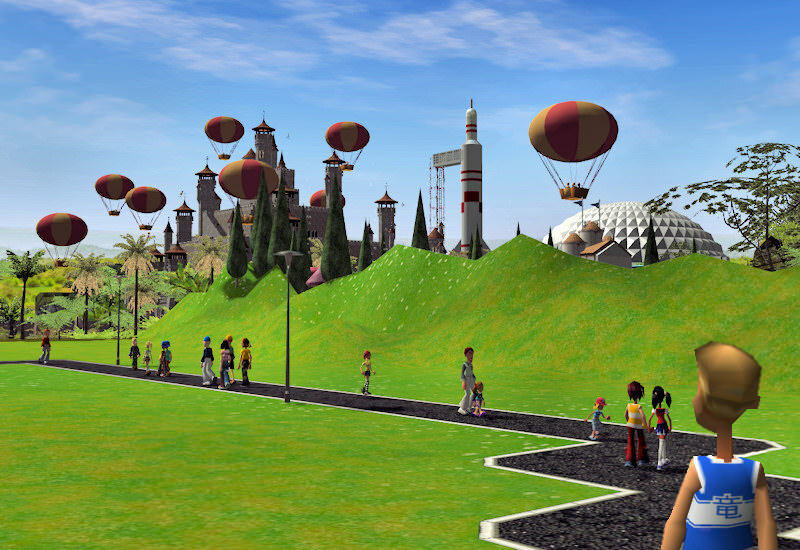 This brings me back to the days when members did so much more with RCT3 other than just building parks. Brilliant stuff! 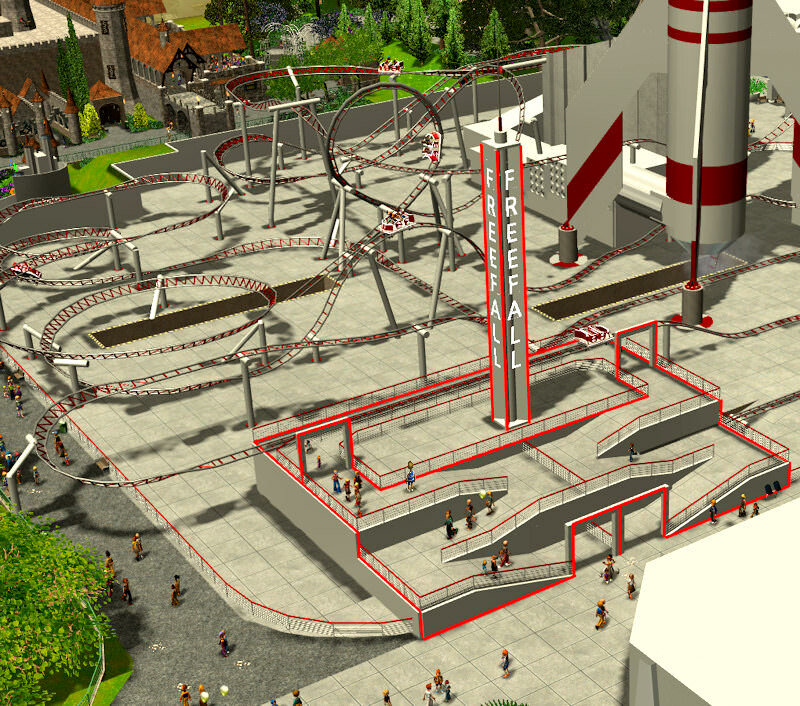 This brings me back to the days when members did so much more with RCT3 other than just building parks. Brilliant stuff! Thanks shyguy, that means a lot! It's exactly why I'm presenting this story/park the way I am. 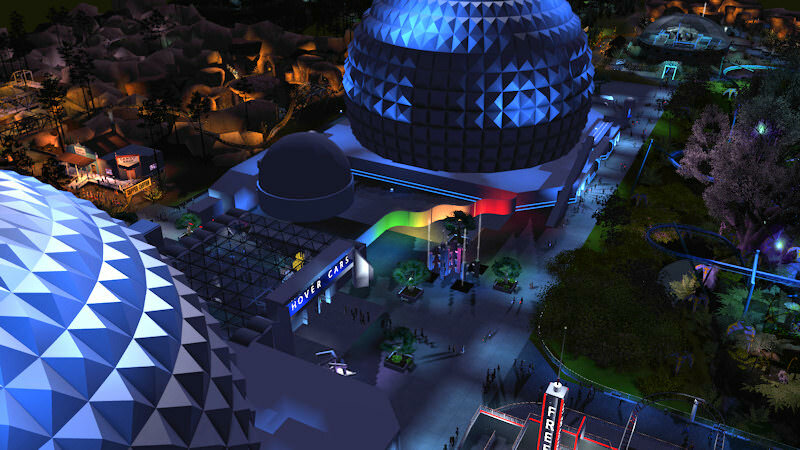 I recall your Wonder World and Water World parks (and currently, the Mr. Wonder shows in PC) and being drawn into the stories. Maybe my efforts will help bring about a RCT3 renaissance. 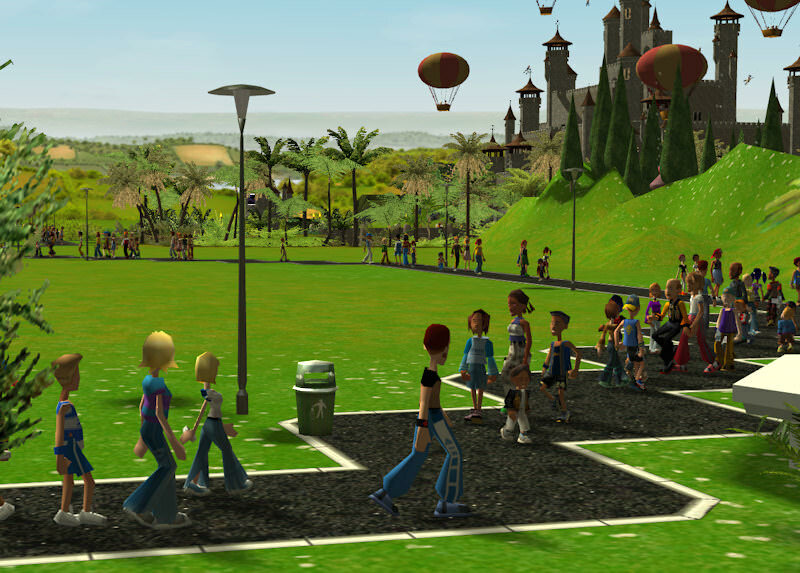 Most people have migrated over to Planet Coaster, leaving RCT3 behind. And that's to be expected; it's the way of the world. But it seems to me that there is room for both games (and others) to co-exist. Each game offers abilities that the other one doesn't, so far anyway. I feel like that was an accurate description of Florida heat! Awesome work as always. The stories are so full of detail much like this park. You always impress me with your creative posts and they are very inspiring! Wally: "Well kids, here we are! On our way to Imaginarium!" Captain Deucalion: "I am 30,000 years old, give or take." Jill: "Aren't these mushroom houses cute?" Wally: "The elevator door is open... why don't you just walk out?" Tiffany: "All riiight, a dragon!" Mermaid: "They're such tiny creatures there's no room in their itty-bitty brains to remember anything." Faerie: "The seawater has pickled their brains, you know." Jack: "John's the name, but everyone calls me Jack." Oops. Sorry, that last line is from an episode that hasn't been posted yet. Um, just forget that you saw it. Me: *attempts Jedi mind-trick* "Move along. These aren't the words you're looking for." You (befuddled): "Words? What words?" 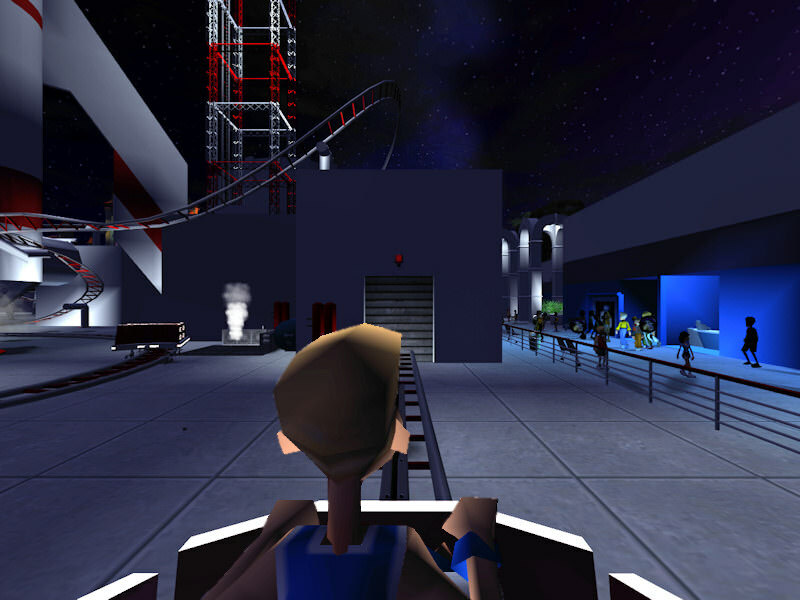 Baxter's futuristic FreeFall car, with its glowing racing stripes, approaches the gantry building which houses the machinery that will hoist him up through the red and white framework to the top of the rocket. Until now, the ride has been a leisurely tour of the launchpad and Baxter could put the 'Big Drop' out of his mind. But zero hour approaches and his anxiety begins to mount. The red warning light above the building's corrugated metal door begins to flash and the door rolls upward allowing the car to enter the restricted area. 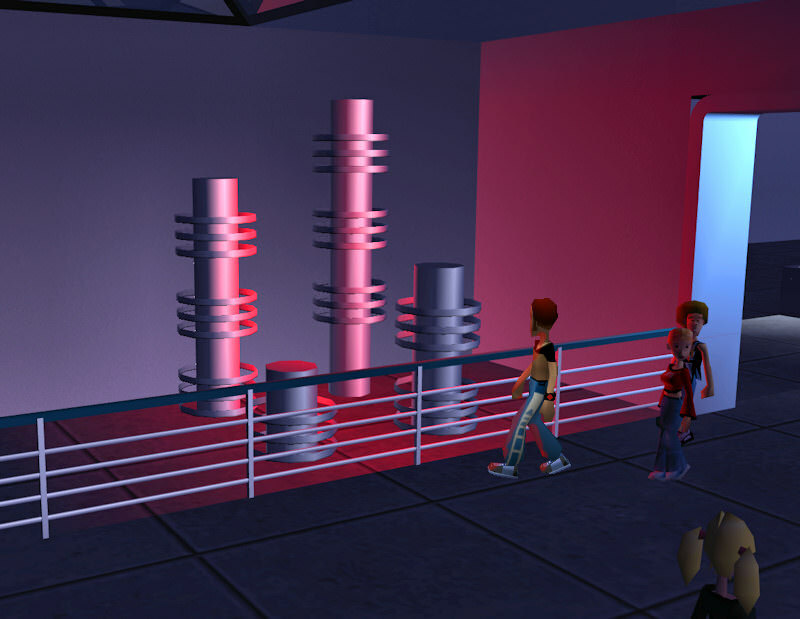 Inside the building, the car turns a corner and begins to climb the gantry amid loud klaxons and whirring servos operating various devices. 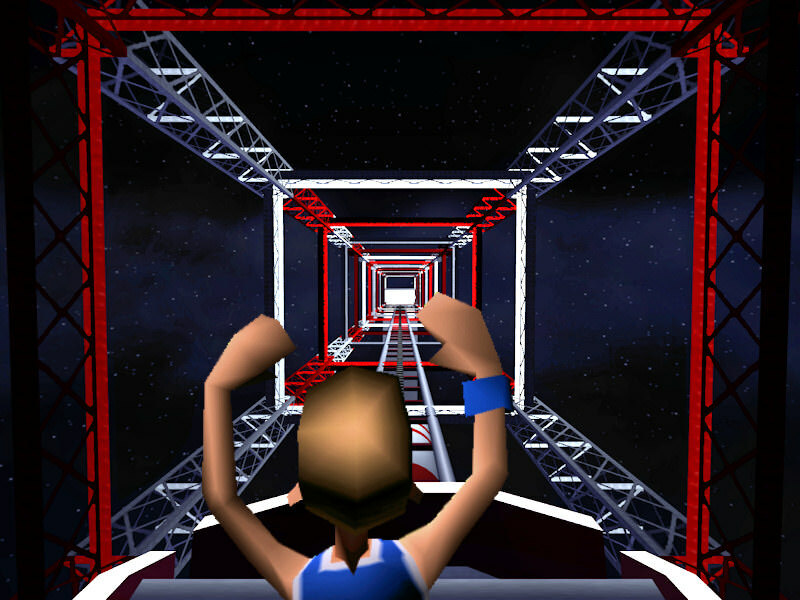 Baxter finds himself staring straight up at the night sky bordered on all sides by the red and white girders slipping past as the car continues to climb. He clenches his jaw tightly shut to stop his teeth from chattering. Determined to prove his bravery, he says to himself, "Okay, let go of the lapbar and raise yer arms in the air to show yer not afraid... yep, all the cool guys do that." His hands refuse to budge so he tries shaming himself into it, "Time to man-up!.. gonna let go now," nothing happens, "Gah! I am such a wimp... okay, in 3... 2... 1... hands up!" Still nothing. Disappointed in himself, he tries one more time, "Okay, this is it... this time for sure... Hands... Up... NOW!" He flings his arms up above his head. One second later his hands have a death-grip on the lapbar again. He has conflicted emotions: pride in achieving his goal, but guilt for grabbing hold again so soon. 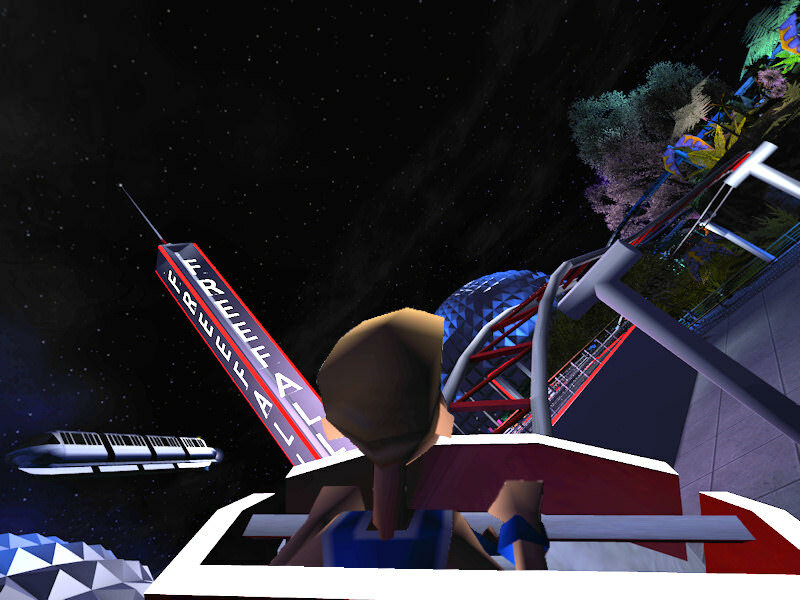 As the car nears the top of the rocket, Baxter looks at the park spread out below him. From this height, everything looks like a scale model and he has a surreal sense of detachment. His fear dissipates and his teeth stop chattering. 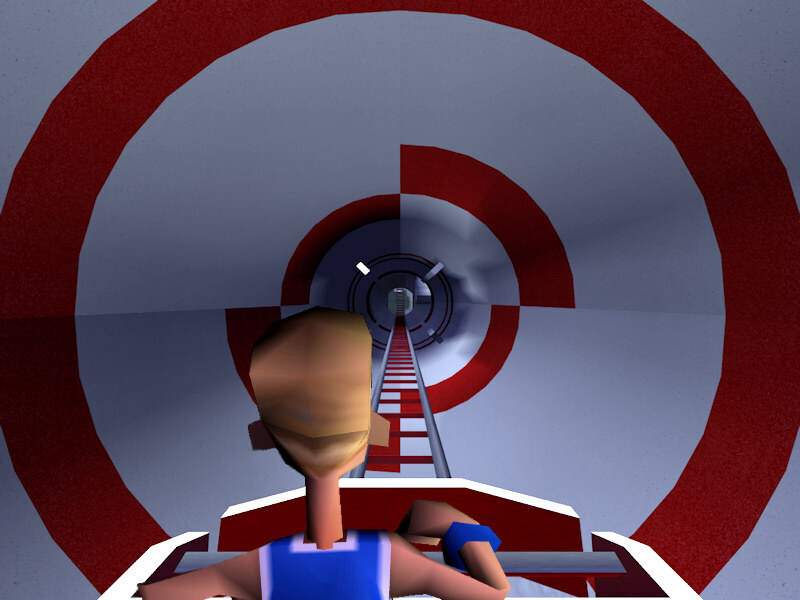 The car abruptly levels out as he enters the 'white room' where the gantry attaches to the rocket, "I'm at the top!" he shouts, not really meaning to. A few feet ahead he sees the track dip down and disappear into nothingness. This is the moment he has been waiting for, and dreading: the 'Big Drop'. His teeth begin to chatter again, "This is it, this is it, this is it." Baxter continues to repeat the mantra as the car tips over the edge of the abyss. Then, "Gahhhhhhhhhhahhhhhhhhahhhhhhh," he yells all the way down the 230 foot vertical drop. The closeness of the rocket's interior makes the car appear to streak downward even faster than the 82 mph it actually does. The car shoots out the bottom of the rocket and levels off into a long narrow trough. 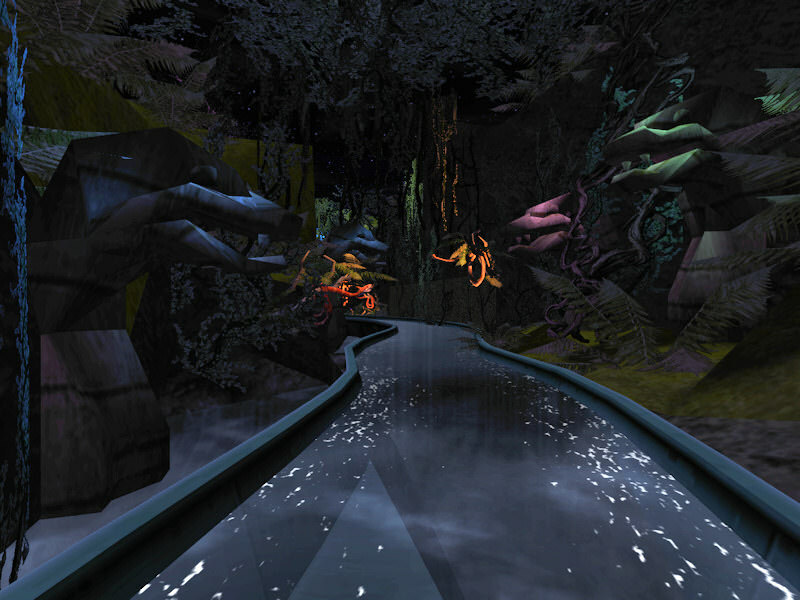 In a flash, the car travels to the end of the trough and disappears into a dark tunnel. Baxter's hands are white and bloodless from the vise-like grip he has on the lapbar. Wally, having finished his business in the 'little peeps room', stops outside the restroom and thinks, "Hmm, I'm not looking forward to taking the elevator with that crazy old-timer again... There's gotta be another route back to FreeFall." 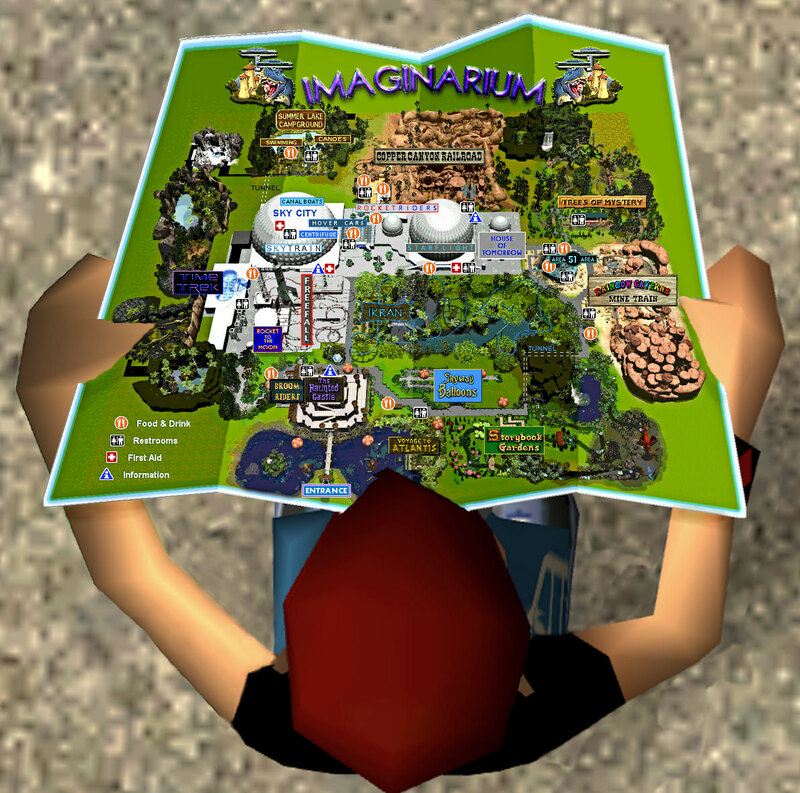 He whips out the park map and studies it, "Yep. 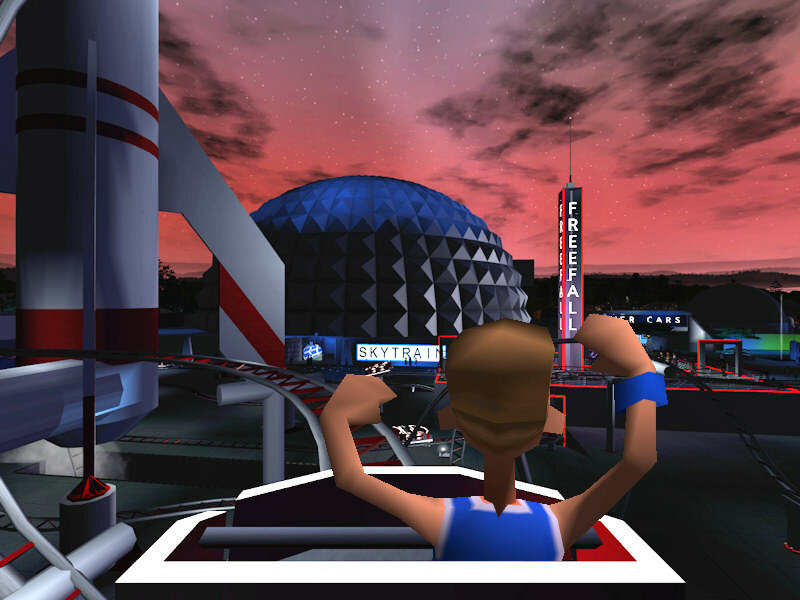 Go straight ahead toward the Hover Cars queue, turn right and go up the ramp to the main level. 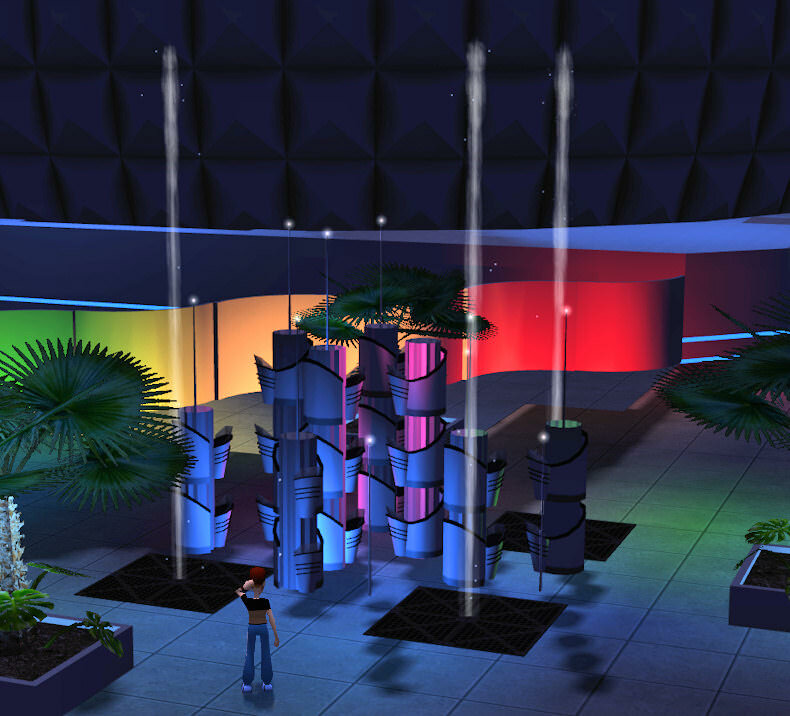 Go through the Atrium and across the plaza to the FreeFall station." He pockets the map and starts off on his trek. 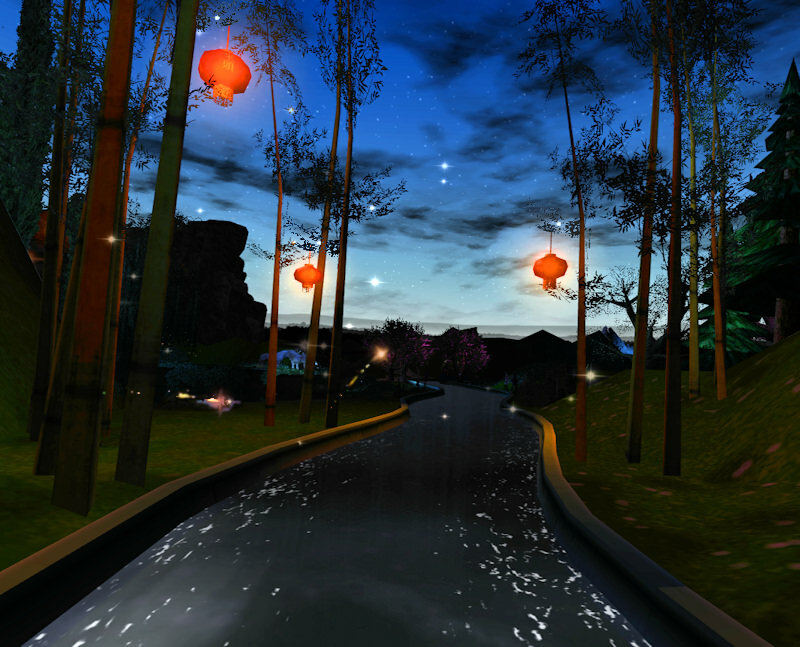 Jill and Tiffany's canalboat floats past the bamboo grove with its hanging lanterns. 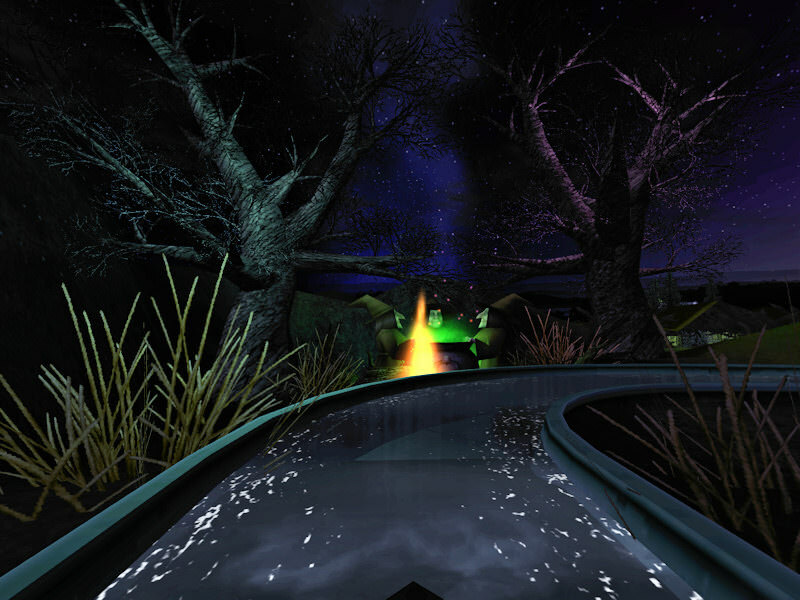 They find themselves alongside the moonlit pond again; this time from the other side, next to the waterfall. 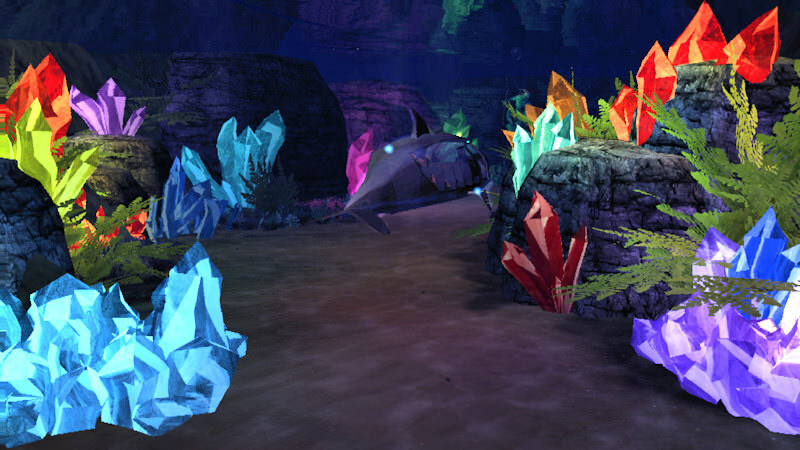 "Oh," Jill says, "this is that beautiful area we passed earlier before we entered the mermaid grotto." "Stupid mermaids," Tiffany says sullenly. "And look, the faeries are still darting overhead, leaving their sparkly trails." "Oh, come on, Tiff. How can you be so negative amidst all this magical beauty?" "Easy! They're boring idiots! Show me some more dragons or trolls or goblins or..." She stops and listens, "Do you hear that?... It sounds like someone is laughing." Jill listens, "...Yes... several people laughing... old women, maybe." The boat goes around another bend in the canal where, up ahead, they see a huge bubbling cauldron surrounded by three old crones, cackling in the moonlight, "Ooh, witches!" Tiffany says with delight, "They're not trolls or goblins, but they'll do." The boat drifts closer, "They don't really look like scary witches, "Jill says, "Maybe they're good witches, like Glinda from The Wizard Of Oz." One of the witches turns toward Jill and Tiffany, "Oooh! What have we here?" she chortles, "Look sisters, another boat approaches!" "Hmm," the second witch says, "My eyes aren't what they used to be, but they appear to be females." "Yes, a brace of them!" the third witch says. "Oh, I much prefer females... that last boat had only males; tough and sinewy. These will be much better, don't you think?" "I don't think these are good witches, Mother," Tiffany says, "I think they plan on eating us!" The witches continue, "[cackle, cackle, cackle] The young one is a swift thinker, she catches on quickly... Not much meat on her bones, but tender, I'll wager." "The old one will require a long stewing time before she's tender, but her fat will add much flavor to the broth." "I am NOT old!" Jill yells at the witches, "... And I'm not FAT, either!" "So, my sisters, which one goes into the pot? The tender, young succulent one, or the old, fat, meatier one?" "I AM NOT OLD!" Jill spits out her words, "I'm still in my thirties... and I am certainly not fat!" "I likes 'em meaty, meself," says one of the witches, ignoring Jill's outburst, "I don't mind a few hours of stewin' if it means a tastier meal." "Why not both? [cackle, cackle]"
"Now there's a thought!... But will they both fit in the pot?" "Oh, I should think so... it is the extra-large deluxe model, after all." While the witches debate the niceties of cooking techniques, the canalboat drifts out of range, "Oh bother," a witch says, "they've skulkered off. Now we'll never know which one is best; young and tender or old and fat." "I AM NOT OLD AND I AM NOT FAT!!" Jill yells back at them. The boat continues to float away from the cackling crones, "Stupid witches," Jill says sullenly. Tiffany can't help but grin a little, "Who's being negative now?" Rather than admit the truthfulness of her daughter's accusation, Jill changes the subject, "Oh! A gingerbread house! Isn't it adorable?... Hansel and Gretel should be around here somewhere, but I don't see them." "Duh," Tiffany says condescendingly, "They're back there simmering in the witches' pot... I think I saw a foot bubble up to the surface as we went by." "Oh stop," Jill says laughingly, then begins to wonder if Tiffany could be right. Jill sniffs the air, "Mmm, do you smell that? I think this house really is made of gingerbread." "Mmmm. You're right... and I can smell the peppermint candy canes, too." As the doors of the gingerbread house open to let the boat pass through, Tiffany breaks off one of the icing icicles and licks it, "Mmm, tastes like vanilla." Jill is about to scold her daughter for vandalizing the scenery when, from somewhere nearby they hear an old feeble voice, "Nibble, nibble little mouse. Who is nibbling at my house?" "Oh dear!" Jill frets, "Now you've attracted the attention of the old witch from the Hansel and Gretel story... She eats children, you know." "Sorry," Tiffany says worriedly, "I thought we were done with witches." But the canalboat passes through the house and out the other side before the witch can make an appearance. "That was close," Tiffany says. She peers down the length of the canal to see what's coming next, "Is that the loading station up ahead?" "I think we're at the end of the ride," Jill says, "And look, the sun is starting to come up. What a beautiful ending for a beautiful ride." Tiffany smirks, "Beautiful?! You didn't think the snakes were beautiful... or the dragons... or the witches... or..."
Jill cuts her off, "I prefer to think of the things I liked, and ignore the rest, if you don't mind. And I seem to recall that you weren't too fond of the mermaids or the faeries or..."
Now it's Tiffany's turn to interrupt, "Let's just say we both enjoyed the ride, but for different reasons. Deal?" With a [kerklunk], the canalboat comes to a halt at the loading station. As mother and daughter disembark, Tiffany looks back at the boat, "I still say they look like birdcages." "And I still say they look like Cinderella's carriage," Jill retorts, "Come on, time to head back to the Imaginarium fountain and meet up with your dad and brother." "And then we'll go on Broom Riders!" "Umm, I think you'll be going on that ride by yourself, dear. In addition to looking unsafe, those skinny little broomsticks just look too uncomfortable." "Are you saying you agree with those witches back there, that you're too old and fat?" Tiffany says teasingly, knowing the response she'll get. Her mom complies, "I AM NOT OLD AND FAT!" she shouts. Every peep within a 50 foot radius turns and stares. 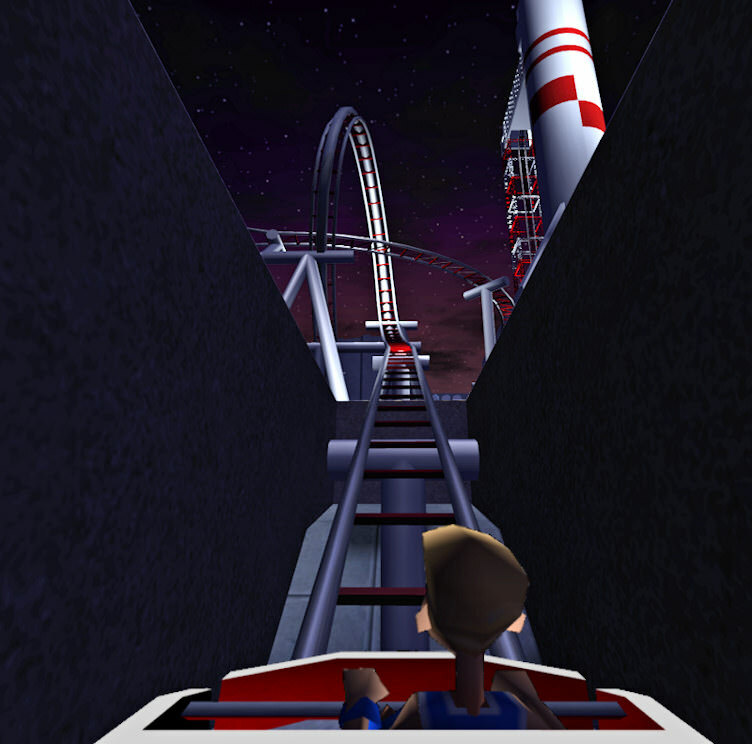 Baxter's FreeFall car rockets out of the dark tunnel and immediately into a vertical loop, "Eeeeeek!" Baxter shrieks. Then, thinking to himself, "Gah! Did that scream come from me? I sounded like a six year old girl! The only thing worse than yeeurghhing at the loading station is squealing like a little girl!" He clamps his mouth shut and vows to never scream again. His car then races through a series of overbanked turns and helixes. As the sky begins to brighten, he executes a barrel roll through the center of the vertical loop he circled earlier. The car enters a slower section of the track, gliding past the huge rocket in a series of banked turns. Baxter, feeling a little braver now, actually raises his arms above his head for several seconds. As dawn breaks, the car goes through a few more turns, a couple of bunny hops and, after braking even more slowly, around a final turn which juts out above the heads of the peeps walking on the path below. Baxter makes a point to have his arms prominently in the air so that everyone can see what a cool and brave dude he is. He still has his arms in the air as the car enters the station and begins braking to a stop. With newfound confidence, Baxter walks toward the exit with a spring in his step and a grin on his face. After passing through the exit arch, he jumps twice into the air, "Yee-haw!" He turns and gazes at the vast expanse of the FreeFall track like a king surveying his realm, "I did that!" he thinks, grinning to himself, "I dub thee Baxter, the Brave!" he looks at the vertical loop with the barrel roll piercing its heart, "Baxter, the Magnificent!" He looks up at the gleaming rocket, "Baxter, the... " Queasiness overcomes him once again, like squirrels chasing each other in his stomach. Disappointed, he looks away, "Baxter, the chicken-hearted... damn." As he starts down the exit ramp, his nausea subsides, "At least I didn't yeeurghh all over the place again," he thinks. Then he reminds himself about how fun and exciting the ride was and how he overcame his fears. By the time he reaches the bottom of the ramp he is amped-up and strutting, "I wanna go on FreeFall again!" Baxter looks around for his dad but doesn't see him, so he dutifully waits near the station watching FreeFall cars whiz around the track. He avoids looking up at the rocket though. Director: CUT! Okay, what's the problem, Jill? Jill, irritated and exasperated: "What's the problem?! I just swallowed another one of those [Cough! Gag. Ptui! ] danged fireflies, that's the problem!" Director turns to Assistant Director: "I thought the firefly wrangler said he trained those bugs to stay above the actors' heads." Assistant Director: "Well, they are bugs, after all. I mean, how much can you actually train a firefly?" Director: "Okay, get the firefly wrangler on-set please, what's the guy's name again? Fisher? Fisherman? Have him round up all his bugs. We'll shoot the scene without 'em and add them in later as CGI during post-production." Director: "CUT! Baxter, Baxter, Baxter... You were only supposed to yeeurghh once in this scene!" Director: "Okay, people. Let's get this place cleaned up and ready for the next take." Director turns to Assistant Director: "Gotta hand it to him though- the kid's a good actor. He can yeeurghh on cue. Repeatedly." Assistant Director: "Yeah, and he can aim it anywhere you want." Zeke the janitor: "Hey uh... Can somebody throw me a towel? My eyes are burnin' like crazy here!" great choices for the 3d shots - i love them. I still can't grasp how this works, but it does. I always love your posts. They are so fun and you create things that I don't think I have ever seen on here. I always find myself wanting more because these posts are just brilliant! Please be quiet and courteous to others and silence your cell phone now. The feature presentation is about to begin. On his way back to FreeFall, Wally leaves the lower level where the Hover Cars station is located and follows the ramp up to the Atrium. 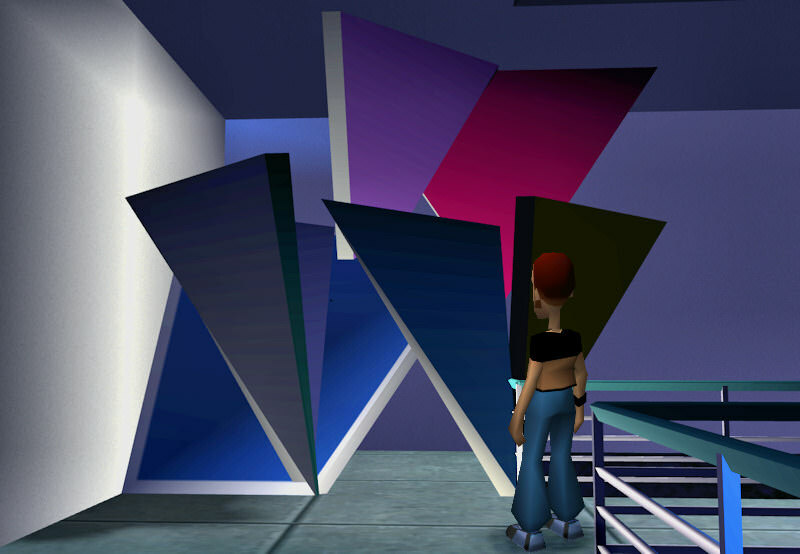 As he enters the building he sees several pieces of artwork on display near the walkway. The first one is right next to the ramp he just came from. He notices a small plaque that gives the title of the artwork, "It says it's called... 'Casa de Picasso'....... I don't get it." He walks over to the next installation and reads the title, "Let's see... 'Magnetic Flux'... they look like fire hydrants to me. All it needs is a futuristic robot dog lifting his hind leg and it'd be complete." Wally crosses the walkway to read the plaque on the next sculpture, "Hmm, 'Quantum Foam'... Okaaay," he says undecidedly, "not sure what that means but it looks kinda neat... oh, there's more writing here, 'On loan by shyguy'... what the heck is a shyguy? Is that the name of a town?... maybe some billionaire who loaned out part of his priceless art collection... or maybe it's the name of the artist," he rubs his chin, "shyguy... goofy name for an artist." 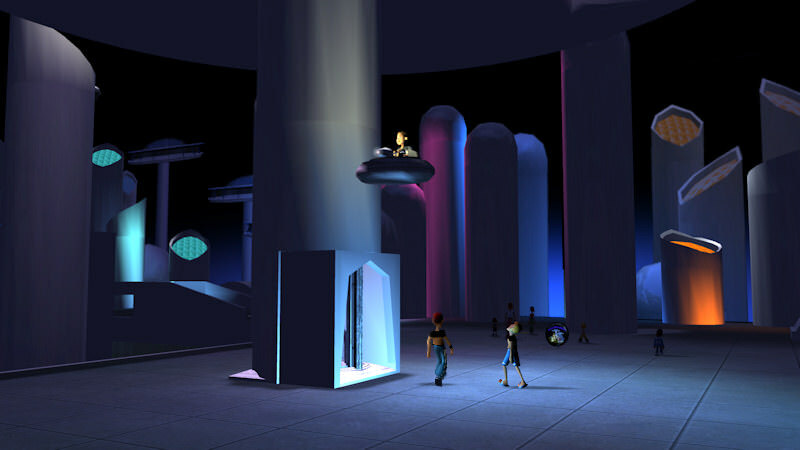 He approaches the next artwork, "'Metropolis'. Okay, now this one makes sense. Wally continues along the walkway to the next installation, "It says 'Nightlife- City Streets'. Yeah, I can see that. It's got that whole neon vibe goin' on." 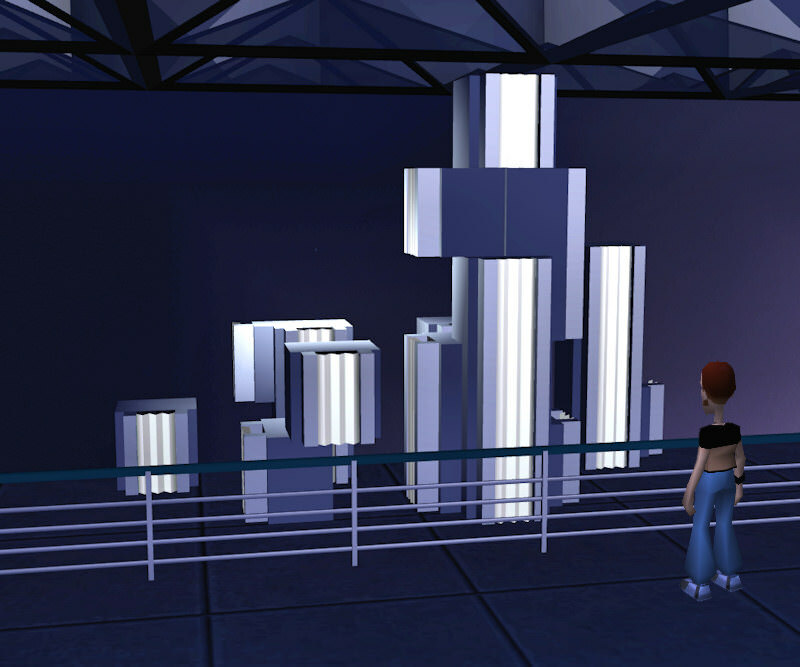 He walks over to the last artwork before exiting the Atrium, "So, what do have we here?... 'Crystal Garden'. Let's see, ya gots yer crystal and ya gots yer pot. Crystal-in-a-pot. Yep... Crystal Garden. Kinda pretty, too." 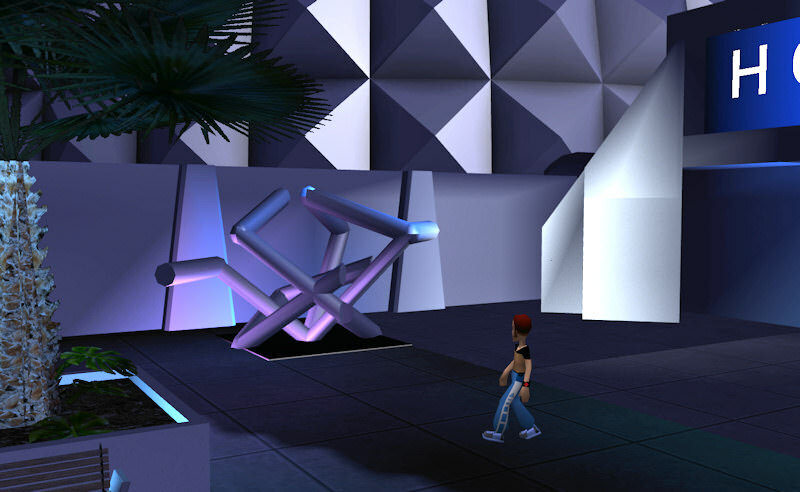 As pre-dawn begins to brighten the night sky, he leaves the Atrium and enters the plaza, "Hmm, another sculpture." "Guess this one was too big to fit in the building." He walks over and reads the plaque, "It says 'Neuron'... I think 'Birdnest' would be a better name... or maybe 'Scrapheap'. The sound of splashing water draws him across the plaza to the final art installation, "Looks like this one does double-duty; sculpture and a fountain. Let's see here... 'To The Stars', it says." He takes a step back to get a better look, "Hmm. Okay, I get it: The tall water jets shooting skyward; the stacked column-things getting higher and higher; the thin spires jutting upwards. Yeah. They all reach up 'To The Stars'... I like this one." As the sun peeks over the horizon, Wally stands and admires the fountain a little longer then looks at his wristwatch, "Well, Baxter should be done FreeFalling by now... wonder if the 'Human Geyser' made it all the way without spewing." He starts off across the plaza to the FreeFall station. 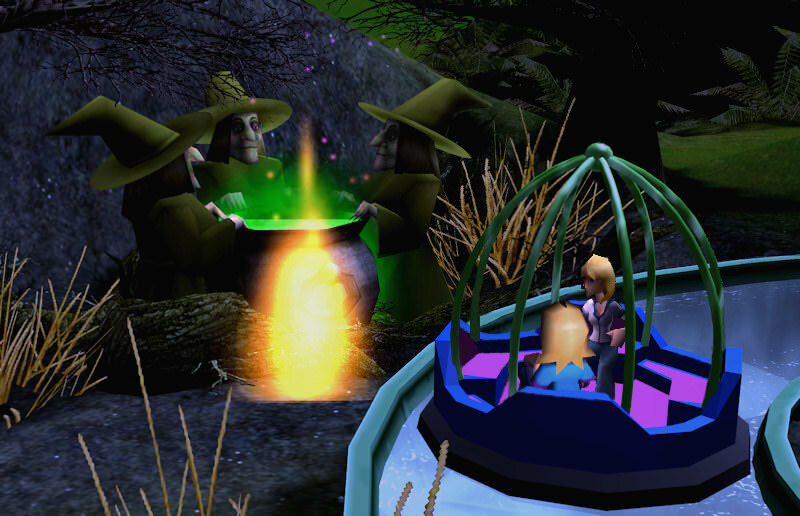 Jill and Tiffany leave Storybook Gardens and begin making their way toward the Imaginarium fountain; 'meeting with group'. Near the entrance to Skyway Balloons, Tiffany stops in her tracks and looks around frantically, "Is someone watching me?... Mother, I think I'm being watched!" A nearby peep hears Tiffany's exclamation and points with awe, "She has been Touched! The Gamer has placed His hand upon her! She is a Chosen One!... Gamer be praised!" A crowd of peeps surrounds Tiffany and place their hands upon her, hoping that some of the Gamer's magnificence rubs off on them, "Gamer be praised. The Chosen One," they chant reverently. Tiffany is becoming alarmed by the press of people around her, "Mother?... Mom?" Jill, standing off to the side as all this is going on, has had enough, "All right, that's it; back off, you wackos!" "But... She is the Chosen One! The Gamer has anointed her!" "The Gamer be damned. Get away from my daughter!" There is a gasp from the crowd, "[Gasp! ]," they gasp gaspingly, "Thou hast blasphemed!" They glance nervously at the sky, expecting to see the Gamer's Hand, in the form of giant tweezers, pluck the sinner from the park and hurl her into Oblivion, which is at Alton Towers, just outside Staffordshire, England. Jill isn't having any of it, "What's wrong with you people?! You're scaring my daughter... This is just a theme park, for Gamer's sake! Now back away." She moves in to extract Tiffany from the clutches of the crowd, "Come on, dear, let's go find your dad and brother." As Jill and Tiffany walk away, another peep a few feet away swivels around and asks, "Is someone watching me?" The crowd immediately responds, "Thou hast been Touched!" They engulf their new Chosen One. After watching the FreeFall cars zip around for a few minutes, Baxter looks around for his dad again- and spots him, talking to someone not far away. He goes over to get his attention, "Hey Dad, I've been... Oh, sorry sir. I thought you were my dad. From behind, you look a lot alike." Baxter studies the guy more closely, "In fact... you look a LOT alike. You could be twins!" He scans the crowd around him, "Hey, there's another guy that looks just like you an' my dad!... And another one!... And there's one that looks just like ME! Man, what's goin' on here? I'm startin' t'get a little weirded out." Just then, Wally comes up from behind and taps Baxter on the shoulder, "Hey, there you are, Son. C'mon, let's go join yer mom and sister." The two of them head for the Imaginarium fountain, "Hey, Dad? How come so many peeps look alike? I thought that guy back there was you, and then I saw some more just like you; even one that looked like ME!" Wally nods his head in agreement, "Tell me about it, Son. A minute ago I went up to yer mom and gave her a little peck on the cheek... Only it wasn't yer mom. It was someone who looked just like her!... Hey uh, let's keep this just between you an' me, okay sport?" Baxter grins knowingly, "Sure Dad. Mom doesn't need to know you've been goin' around kissin' babes." Wally laughs nervously, "Got that right, kiddo." Baxter nudges his dad in the side, "Hey Dad, look at that guy over there. Geez, he looks like a Neanderthal! Kinda scary... I bet he eats little peeps for breakfast... There's another one just like him. Must be a whole tribe of Neanderthals! So why do so many of us look alike, Dad?" Wally repeats the often used phrase when unexplainable things happen, "Well Son, the Gamer works in mysterious ways." Reporter: "We're here today talking with Zeke Zamboni, head of Janitorial Operations here at Imaginarium park. So, Mr. Zamboni, how..."
"Not 'Mr. Zamboni'. Just Zeke." Reporter: "Okay, then. Just Zeke, how..."
"Not 'Just Zeke'. Zeke! Everybody calls me Zeke. You're new at this interview-thing, aren'tcha kid." "Well, no. I... Getting back to the interview, Zeke- How would you describe your job here at Imaginarium?" Zeke: "C.R.A.P. It stands for Clean Restrooms And Park. It's our motto here. Keep the restrooms and park clean at all times. That's our number-one priority." Reporter: "Ah. I see. It sounds like you take pride in your work." "You bet. Our restrooms are so clean you could eat off the floor." Reporter: "Um, I'll just take your word on that." Zeke: "No really! Go ahead and eat off the bathroom floors. They're cleaner than the park benches, y'know; what with little kids peein' on 'em and stuff. I mean, we give the benches a good scrubbing every morning but geez, you wouldn't believe the filth and stuff we find there." Reporter: "Okaaay... 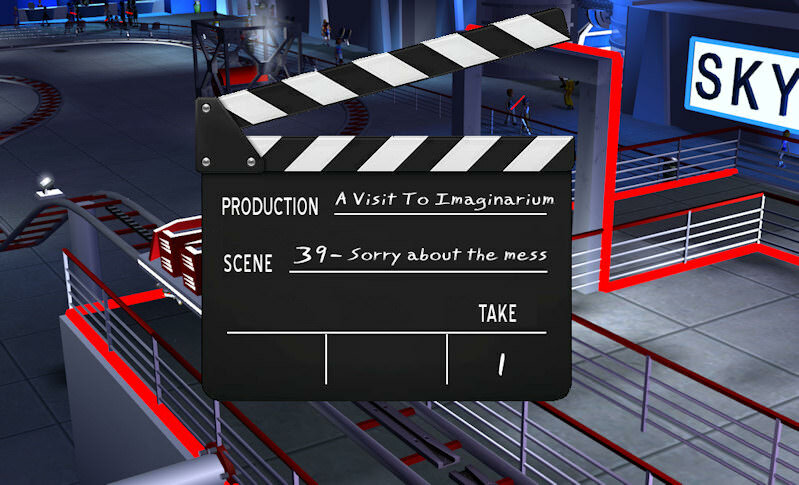 I guess it's safe to say that the Imaginarium restrooms are very clean, then." "Yep. Spick-n-span. Clean as a whistle, except on the janitors' day off. Then, well..... We keep the restrooms stocked several times a day, too: paper towels, hand soap, toilet paper- and none of that cheapo single-ply TP that you can see through, either. Nope, we use only the best two-ply, extra soft, jumbo sized rolls. Takes a bigger bite out of the budget but the guests notice things like that. That's what keeps 'em coming back to the park." Reporter: "As I walked around the park, I noticed how the restrooms all have their own look- how they blend in with the theming of each area." 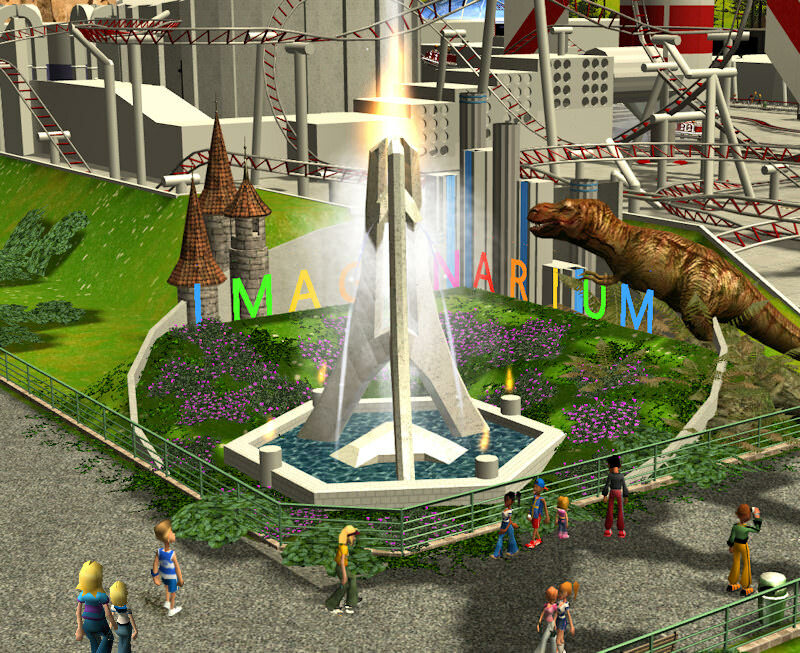 "Yeah, that's one of the hallmarks of Imaginarium; our themed restrooms. Ya gots yer Medieval Castle theme, yer Voyage To Atlantis theme, Old West, Rustic... and then there's the futuristic Sci-Fi themed ones. Don't know much about those though, my guys won't enter through the force-field, hologrammical, whatchamacallit doors on those things." Reporter: "The janitors don't go into the sci-fi themed restrooms?" "Nope. Me neither. We just toss the TP and stuff through the force-field. It must be workin' out okay though, we haven't had any complaints from the guests." Reporter: "But surely, you must..."
Zeke: "JB got those futuristic bathrooms from the same place he got that Area 51 saucer over there. I think they come from 'out there'. "Yeah, you know; the little gray guys from Mars or Venus or wherever they come from. My take on it is- Those force-field thingies are really transporter beams. When a guest walks through, he's disintegrated and zapped to some planet somewhere. After he's done with his business, he gets zapped back to here. That's my theory anyway. Hmm, maybe it's the little gray guys who put the supplies where they belong after we toss 'em through the doorway." 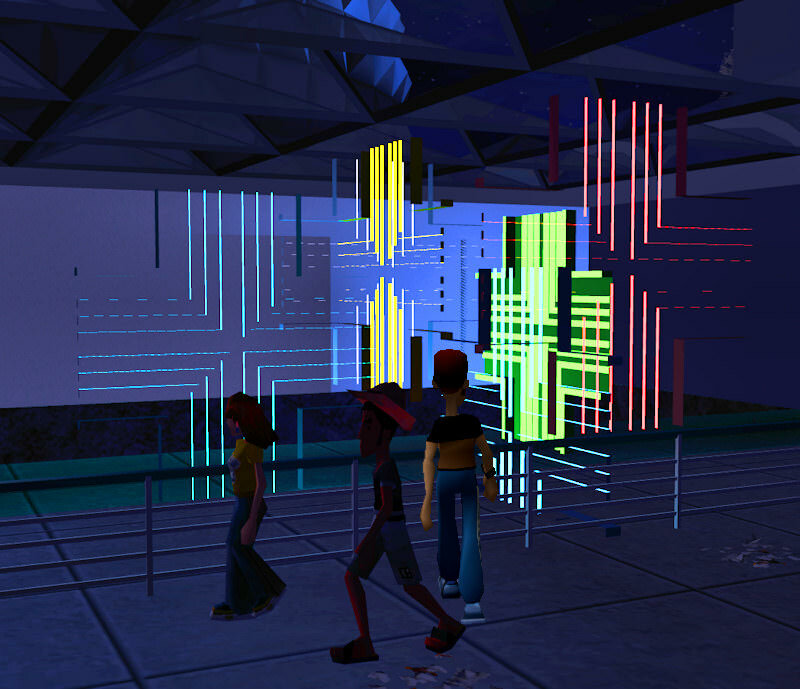 Reporter: "So okay then... other than not entering the sci-fi restrooms, is there anything else that presents a challenge here in Imaginarium?" Zeke: "Well, there's this one kid; seems like he loses his lunch every time he opens his mouth. 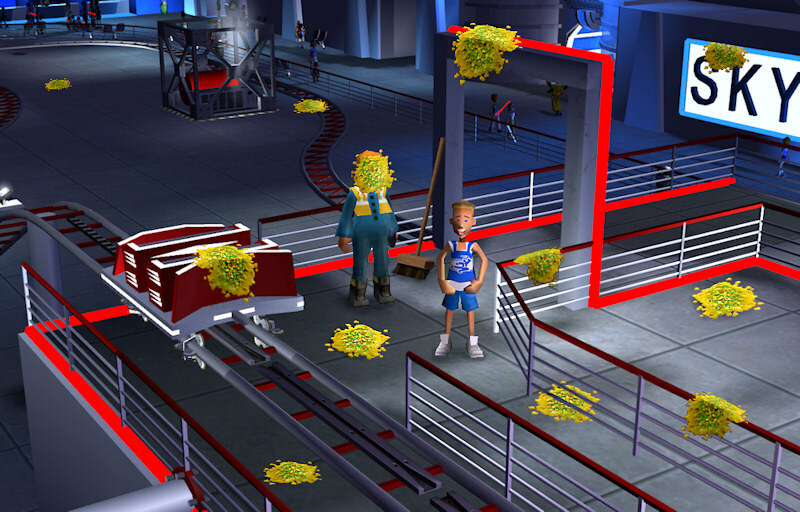 I had to assign one of my guys just to follow him around and clean up after him... Oh, hold on a sec, my phone's a buzzin' [checks phone]..... Hey uh, sorry, but I gotta go. That kid I was tellin' ya about? He just tossed his cookies again." Reporter: "Well... I guess that's it for now, folks... Tune in next time for our interview with Candy Floss, head of concessions here at Imaginarium park." Reporter (to cameraman): "Aaand cut..... Are we off the air?... Man, that guy was denser than year-old fruitcake." Cameraman: "Yeah, and just as nutty." 'On loan by shyguy'... what the heck is a shyguy? Is that the name of a town?... maybe some billionaire who loaned out part of his priceless art collection... or maybe it's the name of the artist," he rubs his chin, "shyguy... goofy name for an artist." Well, I don't do sculptures, nor am I a billionaire, so it must be another shyguy. Probably that guy who's always giving those Mario brothers a hard time. Love the guide to the bathrooms. I think all parks should have that. It makes for such fascinating reading. This park is amazing and the storytelling is even better! I love your graphics and it only makes me want to start doing more graphics in my posts because they are just spectacular and serve a purpose. The restroom guide is genius! It's threads like this when I wish that the RCT parks forum would be more active. What an amazing project you have here! Simply beautiful, there's so much to discover! @shyguy: Whaddya mean you don't do sculptures? You make 3D stuff in modeling programs. 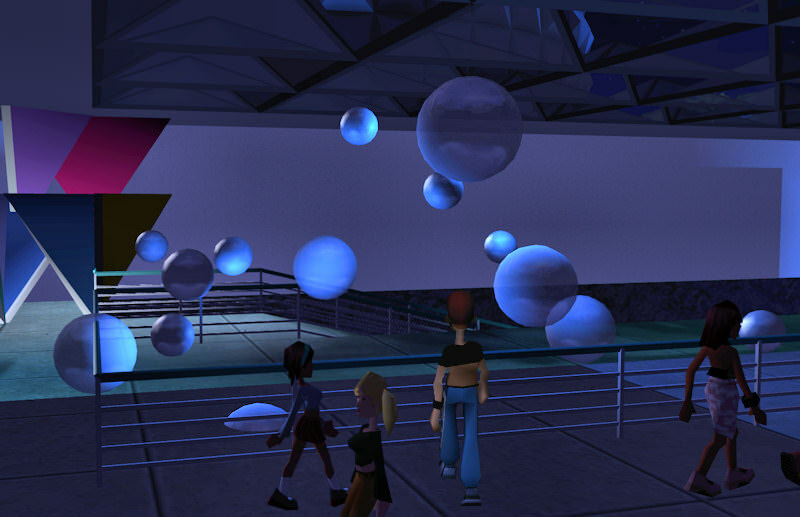 Those globes I used in the Quantum Foam sculpture came from one of your Circus Center sets. @cody: The graphics are fun to put together, but they also (usually) take quite a while to make, at least with me they do. From what I gather, time isn't something that you have a lot of these days. But I'd like to see what you come up with. @Elch: Thank you! I guess it's because of the low activity here that I feel the need to include a lot of Extra Stuff just to get people to take a look at the thread. 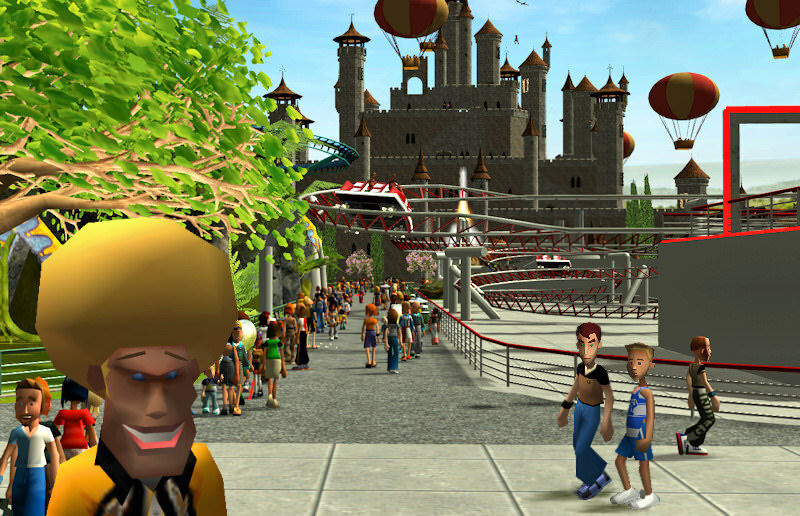 Maybe if a few more of us RCT3 players post more of our projects it will generate even more activity; more activity begets more activity, (hopefully). 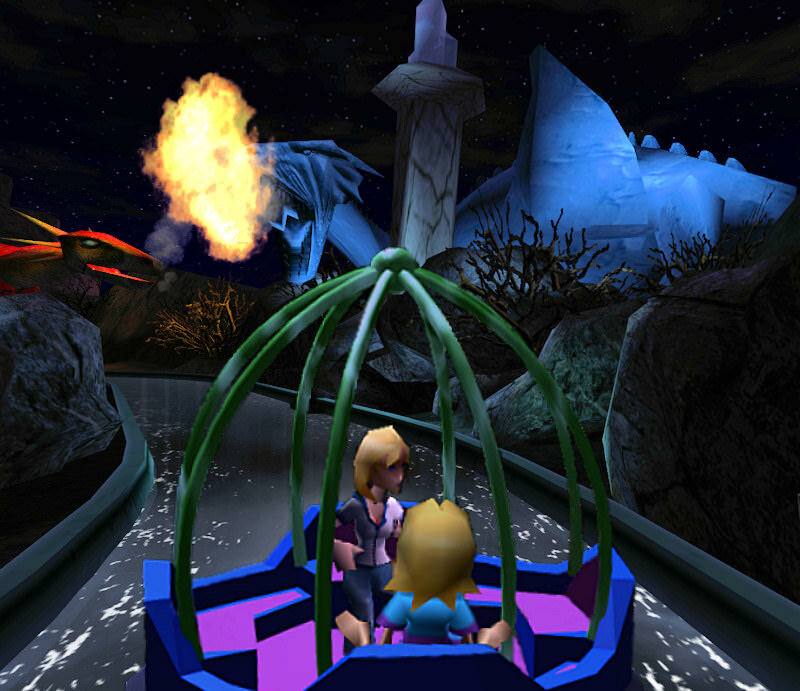 Jill and Tiffany arrive at the Imaginarium fountain. Jill looks around this way and that, "I don't see your dad or brother anywhere, do you?" "No," Tiffany replies. Then, thinking about the unpleasant incident a few minutes earlier, "You'd better be careful twisting around like that; people will think you're the next Chosen One." "Well let 'em try. I've got a few salty words to hurl their way if they do." Tiffany smiles. She's a little surprised by her mother's scrappiness and feels comforted that her mom will come to her rescue if need be. 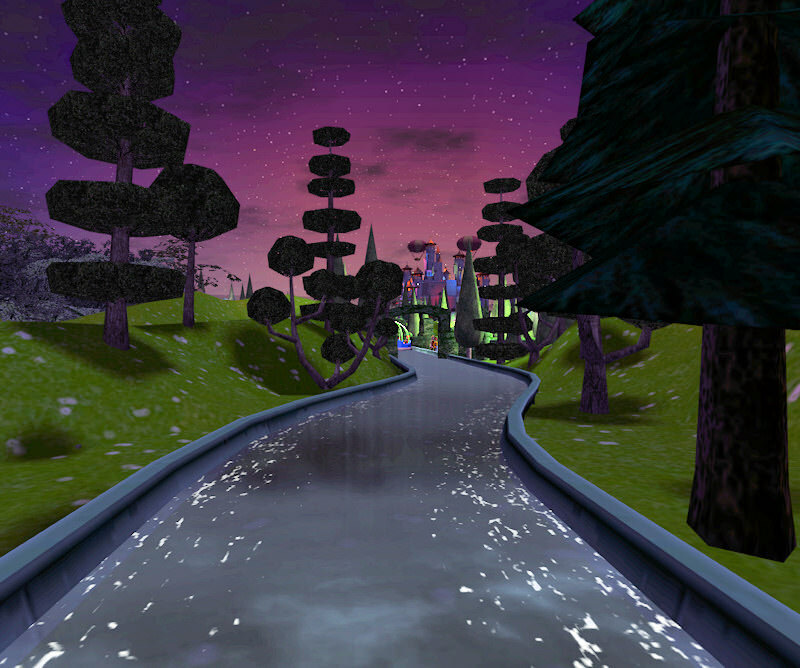 Walking with his dad along the path back to the fountain, Baxter gazes to his right and grins as he sees the twisted mess of spaghetti that is the FreeFall track, "Wow," he thinks, "I actually rode on that! Me! And I didn't yeeurghh!... well... just that once at the loading station." He notices several peeps walking up a covered queue to the left of the FreeFall rocket, "Hey, Dad. Look over there... It looks like those people are going up inside the rocket through that connector thingy! What ride is that?" "Hmm, not sure." Wally takes the map out of his back pocket, "Let's see... says here it's Rocket To The Moon... Did you see any people inside the rocket when you were on FreeFall?" "No... but I was goin' so fast down the inside I probably wouldn't have seen 'em anyway." He neglects to mention that he was also too scared to notice much of anything while hurtling down the inside of the rocket. Wally puts the map away, "I guess we'll have to check it out later; to find out where all those people are headed." Joe Sluggerball muscles his way throught the crowd, "Outa my way, kid!... Comin' through." Baxter looks to see what all the commotion is about, "Hey! There's Joe Sluggerball!" Then his joyful expression turns into a puzzled frown, "But, this is a sandbox park. I didn't think VIPeeps came to sandbox parks." "The Gamer works in mysterious ways, Son," Wally says again, dismissing the incongruity. "Hey! Maybe I can get his autograph." Baxter starts running toward the gaggle of peeps surrounding the ballplayer. As he gets closer, he can hear some of the conversation between Joe and the crowd of peeps: "No, I'm NOT gonna give you my autograph- I only give autographs to winners; you look like a loser to me, kid; now beat it. And YOU, why I oughta... This bat is good for sluggin' more than just baseballs, y'know... Wish I'd brought my brolly." Crestfallen, Baxter walks back to where his dad is waiting. Wally notices his son's expression, "Why the sad face, sport? Didn't you get Joe Sluggerball's autograph?" "Yeahhh, well... on second thought, I think I can do without his autograph," his puzzled frown returns, "Dad? What's a brolly?" Wally scratches his head, "Well, I'm not sure. Why do you ask?" "Joe Sluggerball said (among other things) that he wished he'd brought his brolly." "Oh," Wally rubs his chin, "Well, I think that's what they call an umbrella in England. It's British slang." Baxter looks dumbfounded, "But... It's not raining. And Joe Sluggerball is a toughguy, why would he want to use an umbrella? Wouldn't he just, y'know, let himself get wet?... And why does he sound British anyway? He's American through an' through... I don't get it." "Well Son, the Gamer..." "...works in mysterious ways," Baxter finishes the old adage, "Yeah I know, I hear that a lot. But it still doesn't answer anything." "Let's go find yer mom and Tiffany. I'm sure they've been 'waiting for group' several weeks by now." 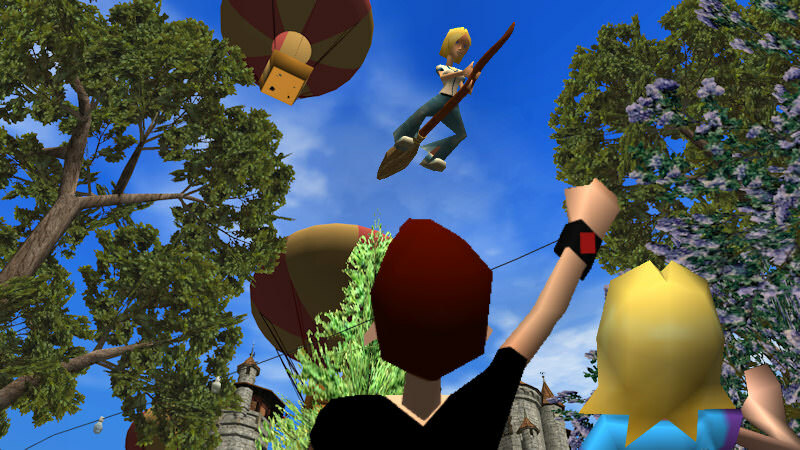 Tiffany looks up and sees a broom rider fly overhead, "Ooh! I'm definitely going on that next. And the entrance is just on the other side of those archways." Jill watches the precarious broom swoop by, "Not just yet, dear. We've gotta wait till your dad and Baxter show up so we can decide what to do next." "Well wait no longer, m'lady, for we have arrived forthwith," Wally says with a grand flourish. "My," Jill grins, "aren't we sounding elegantly medieval." "Tis the castle, m'lady," Wally gestures, "It doth bring out the chivalrous knight in me." Baxter and Tiffany roll their eyes. "I'm going on Broom Riders next!" Tiffany says excitedly. 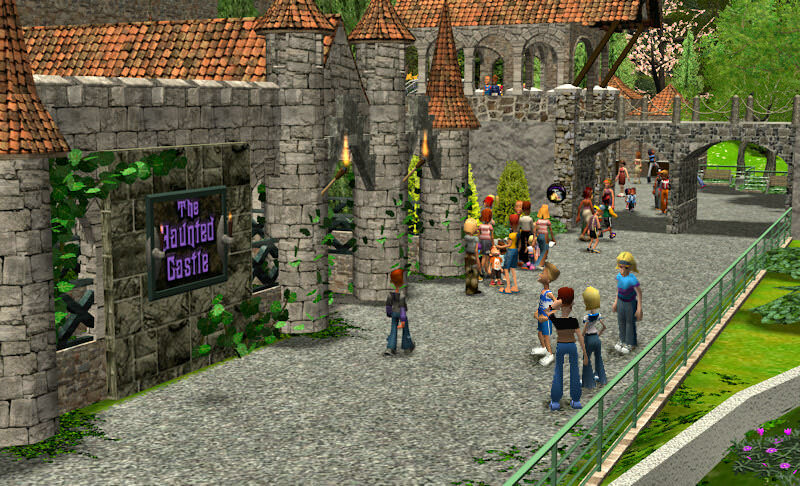 "And I'm going on The Haunted Castle," Baxter says, "The entrance is right in front of us. Anybody comin' with me?" "It does look like fun," Wally says, "but my stomach has been growling for a while now. I need to get something to eat; and I think I see some food and drink stands just through the archways there." "I'm feeling a little hungry too," Jill says, "You kids go on your rides. We'll sit this one out." "And Baxter?" Wally says, "When you're done being scared of the ghosts, your mom and me will be waiting somewhere near the Broom Riders exit... Have fun and don't pee yer shorts!" "Aw, Daaad," Baxter says as he walks across the path toward the entrance. The rest of the group heads down the path and through the archways. "Wally," Jill says, "you shouldn't embarrass Baxter like that." "Aw, he loves it when I tease him." "Oh, is that why his face was all red?" "Here's the Broom Riders entrance!" Tiffany says excitedly, I'll see you guys later, okay? Watch for me as I fly overhead!" She runs through the entranceway and gets in line. 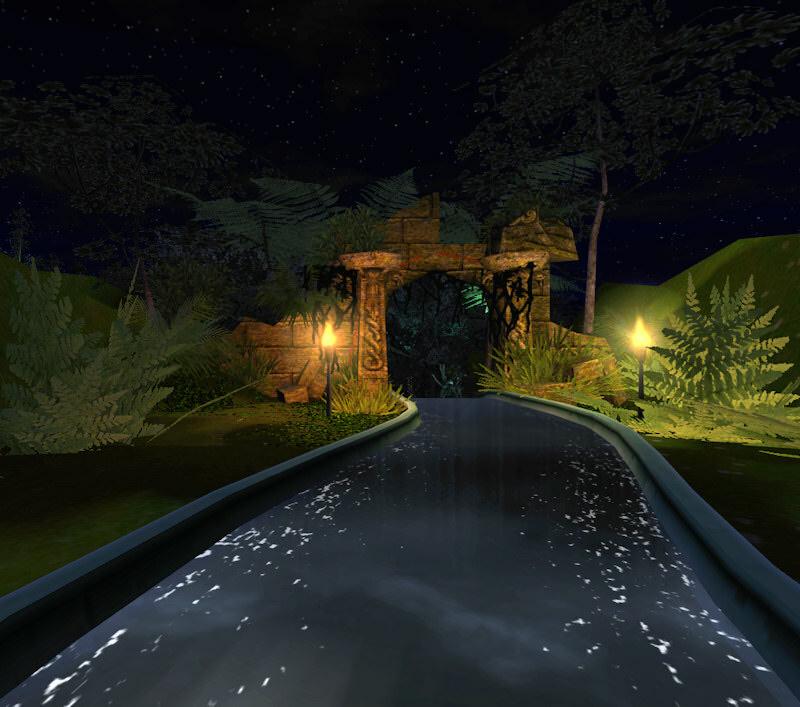 The sound of a funeral dirge accompanies Baxter as he winds his way to the front of The Haunted Castle queue where he sees the eerie looking carriages awaiting him. Grinning ear-to-ear, he quickly takes his seat. 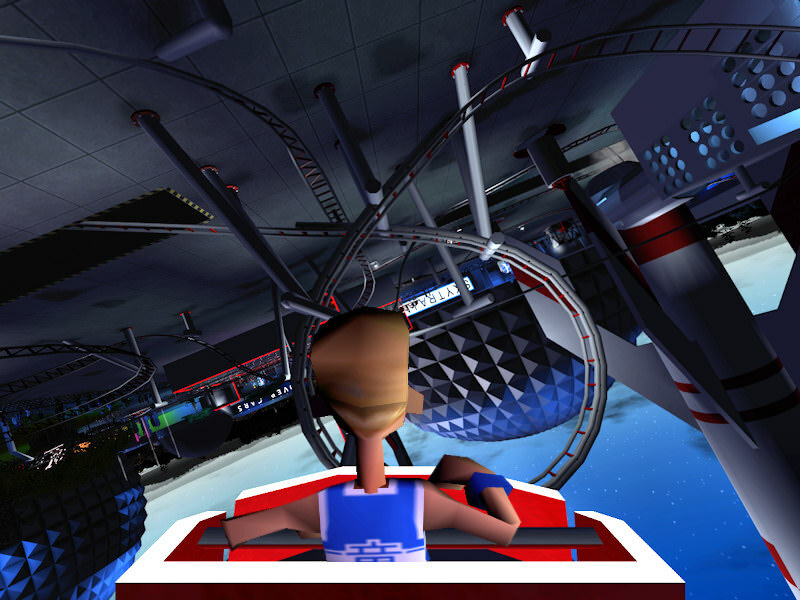 The fear and dread he felt when boarding the FreeFall car is completely absent here, "Let's roll!" he shouts. Wally and Jill opt for hamburgers at the food stand. "Quarter pound burger has masses of toppings!" Wally says. As they wait for their burgers, they turn and see Tiffany waving at them from high up in the Broom Riders queue; they wave back. Wally grins, "She sure is looking forward to riding those things, isn't she. I can see why you don't wanna go on it though." Jill is still smarting from the 'old and fat' comments made by the witches in Storybook Gardens. She snaps back at her husband, "What's that supposed to mean?" Wally is taken aback, "Huh?... Oh, nothing really. It's just that I wouldn't be caught dead riding those things... Like you said earlier, there's nothing to keep you from falling off. And just the thought of sitting on those skinny broom handles for several minutes makes the ol' family jewels scream in pain." Jill chuckles at her husband's self-deprecating humor and feels guilty for snapping at him. After they pick up their burgers Jill looks around, "It looks nice through that arched arbor. Let's find someplace to sit over there, okay?" They go through the arbor and sit on a nearby bench. Jill takes in the surroundings, "Oh, what a pleasant area of the park this is! The ornamental trees, the colorful flowers; so peaceful and quiet." Wally takes a bite of his burger, "Yep," he stops and listens for a second, "Except for the dinosaurs." "I hear dinosaurs 'gronking' somewhere nearby; dunno where." Jill begins eating her burger and listens more closely, "Hmm, it does sound like dinosaurs." Wally takes another bite, "And then there's the music coming from the Broom Riders station; it sounds familiar." "...Why yes," she suddenly realizes, "It's the theme from Harry Potter." "And wasn't that the spooky music from Disney's Haunted Mansion we heard in front of The Haunted Castle?" Jill ponders for a moment, "Yes, it was... And now that I think about it, we heard the fairytale theme from Shrek when Tiff and me were on Storybook Gardens." Wally swallows a bite of his burger, "You'd think a place like this would hire someone to compose original music for the park instead of stealing it from every movie ever made." "It all fits nicely with the theming though." 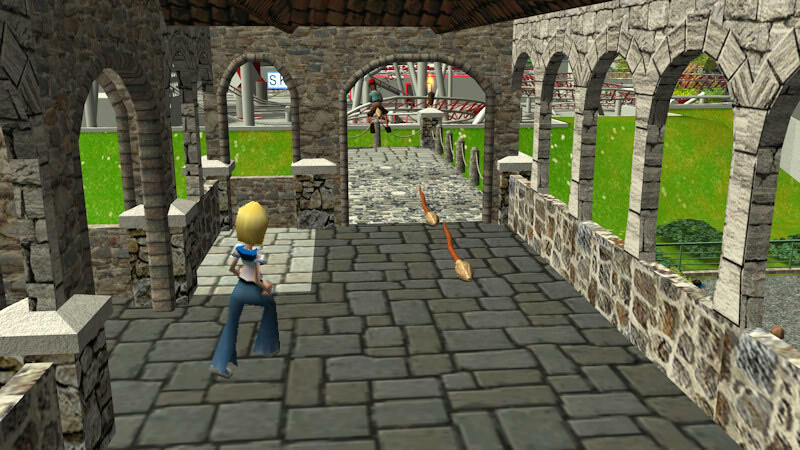 Tiffany reaches the front of the Broom Riders queue and runs out onto the cobblestone platform to mount her broom. She barely has time to get herself situated before the floating broomstick starts to glide forward through the stone archway and out onto the balcony. The broom begins to climb, banking into a wide left turn. Gripping the broom handle tightly, she skims over the decorative treetops, under which, her parents are sitting. Jill and Wally are enjoying their surroundings when they here someone shout, "Hey!" They look around, but don't see anybody. They look up just in time to see their daughter soar overhead. They wave at her, "Don't fall off!" Jill calls out to her. "Woohooo!" 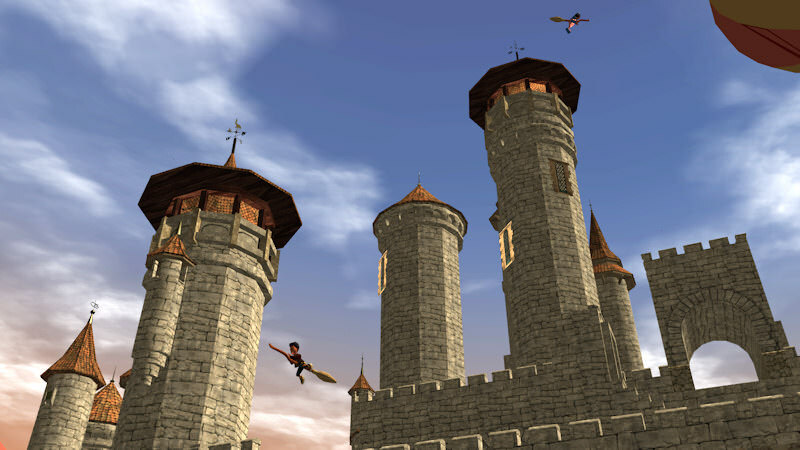 Tiffany yells joyfully as she flies above the Broom Riders station and disappears amongst the battlements of the castle. And here's another way to see 3D images (sort of). Animated GIF 'wiggles'. Even those of you who can't do the 'cross-eyed' method can see these. Reporter: "This week we're interviewing Candy Floss, Head of the Concessions department here at the park. So, Ms. Floss, what..."
"Y'all can call me Candy, sugar. Everyone does." Reporter: "Okay then, Candy Sugar, what are..."
Candy: "Not Candy Sugar, silly. Just Candy; although I am pretty sweet, if'n I do say so myself (and I do)... Why, I do declare, if y'all ain't the cutest little thang this side o' Dixie." 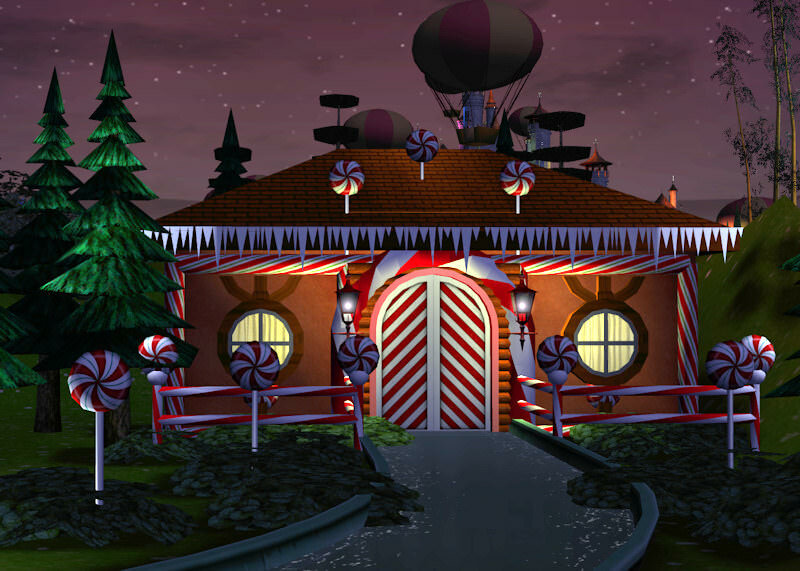 Reporter: "[cough] Um, okay then, Candy, what is your job here at Imaginarium?" "Well sweetie, I go around to all the shops and stalls and take inventory. Then I do all the orderin' and stuff, so's we don't run out o' nothin'. You know- food, drinks, souvenirs, that sort of thing. The guests really chow down on their hotdogs and hamburgers- they go through those faster than grass through a goose, I'll tell you what. I'm rather partial to the cotton candy myself." Reporter: I see you've got your inventory notebook with you; it looks sort of... smudgy." Candy: "It does look a might sticky, don't it. I gotta sample the wares when I make my rounds, y'see; to make sure the food 'n drink is up to our high standards here at the park. I take a little bite o' cotton candy, a sip of root beer, a french fry or two, some cotton candy, nibble on a hot dog, a bit o' cotton candy..."
Reporter: "Speaking of cotton candy, I see that your beehive hairdo is bright pink; cotton candy pink, if I'm not mistaken." "Why, how sweet of y'all to notice! I couldn't decide if I should go with the pink, the blue, or the purple today. But ya know, honey, pink is my favorite color." 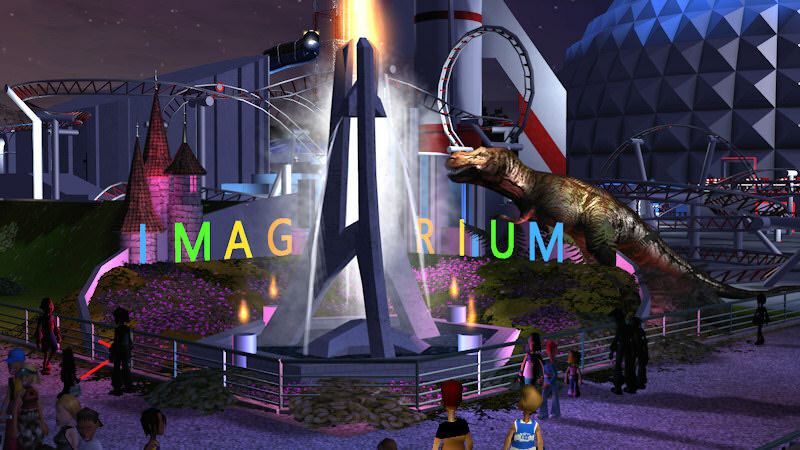 Reporter: "So, what are the most popular items here in Imaginarium?" Candy: "Hotdogs are the most popular food item, followed closely by burgers. But we go through more soft drinks than anything else: Zipsi-Cola, Grandad's Root Beer, Gurgle-Urp. We tried offering burdock juice once, but none of the guests knew what it was; couldn't even give the stuff away; ended up havin' to dump it all out. JB was furious with me, I'll tell you what. But that's okay, I just turned on the ol' Candy Floss charm an' everything was all sweetness an' cream after that." Reporter: "But, I thought everything was free here in Imaginarium. The food, the drinks, the rides, everything. Money seems to be of no concern to JB. Why would he care if you had to dump out a bunch of juice?" "Exactly! Y'all know where I'm comin' from, don'tcha sugar-pie. And anyway, JB can't complain about some li'l ol' juice goin' to waste when he insists on pushin' all those futuristic sci-fi concoctions on the guests. They can't make head nor tails of the stuff... and neither can I!" Reporter: "Well, like what sort of stuff?" Candy: "Ya got yer 'space juice', yer 'nebular nectar', 'constellation crush', 'meteorite splash'- nobody's ever heard of those things before! We haven't got a clue what all goes into it, neither. We don't even know where it comes from! The containers of drink concentrate just show up at the front gate, no questions asked. I may have been born, I say, I may have been born at night y'all- but it weren't last night! (I think it gets delivered by space aliens!) Or time-travelers. Have you seen those strange restrooms JB installed here? Somethin' mighty screwy is goin' on in this park, I'll tell you what." Reporter: "That seems to be a recurring theme amongst the staff here- aliens in UFOs, time-travelers..."
"Well look around you, honey-pie! Y'all got that Area 51 saucer over yonder, flyin' monorails, broomsticks, hover cars... where else would they have come from? T'aint natural, I tell ya." Reporter: "Hmm... when you put it that way..."
Candy: "You don't know the half of it, sugar. I've seen things that'd make yer... oh, hold on fer a sec, would you, sweetums? My phone's a vibratin'... [looks at phone]... sorry Mr. reporter-man (y'all really are the cutest thang, y'know), but it seems one of our guests has come down with a case of uncontrollable burpin' after drinkin' some of that 'nebular nectar' stuff; whatever it is. That's the third time this week. I guess I'm a gonna have ta pull it from the drink stands an' dump it. JB can get madder 'n a wet hen if he wants, but that stuff has got to go. Y'all come back and see us agin real soon, y'hear? Ta-ta honey sugar-pie. (So cute!)" Reporter: "Well, that wraps up our interview for this week, folks. Tune in next time when we'll be speaking with Gus Gearhead, Chief Mechanic here at Imaginarium." Reporter [to cameraman]: "Aaand cut... Geez, I drank some of that 'nebular nectar' stuff just before we started this intervi[eeuuurrrrp] Gawd! I hope I'm not star[rrrruppp]ting to get those uncontr[oOOrrrrp]able bur[rrrRRRrrpp] burps! Oh gawd, oh gawd, oh gawd!" Cameraman: "Hey, I drank some of that stuff, too[rrrrpp]! Oh, cra[aaRRrrp]!" You'll notice my username (JB) appearing here from time to time. You won't see it in the main story, only amongst the Extra Stuff- the interviews and such. I wasn't planning on inserting myself into the mix, but I found that I needed to have a park manager, or owner, that the characters could refer to occasionally. I could have come up with a fictitious character and given him an over-the-top, unbelievable name like, say, Mr. Wonder or something equally outrageous. 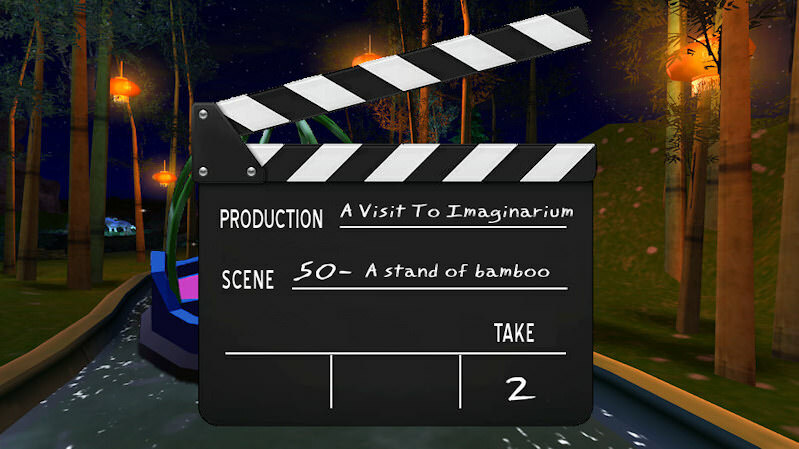 But since I'm the one who built the park, it made sense that I would be the owner/manager... Actually, a lot of talented artists built the objects that appear in Imaginarium- I just made use of those objects in my own particular (and peculiar) way.